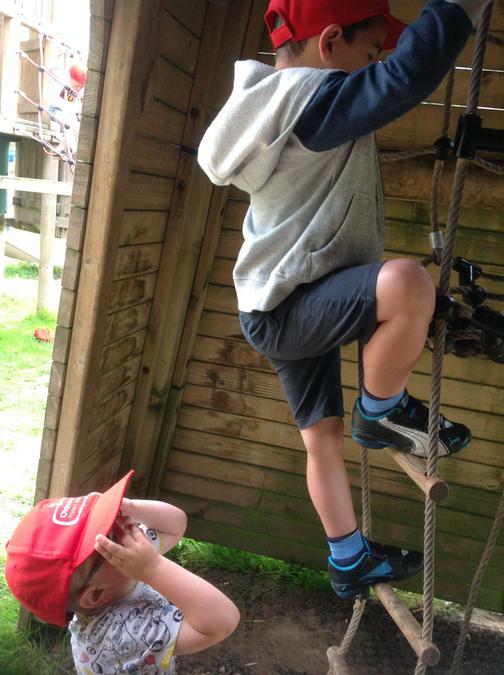 This week we have enjoyed a week of fun and laughter together. 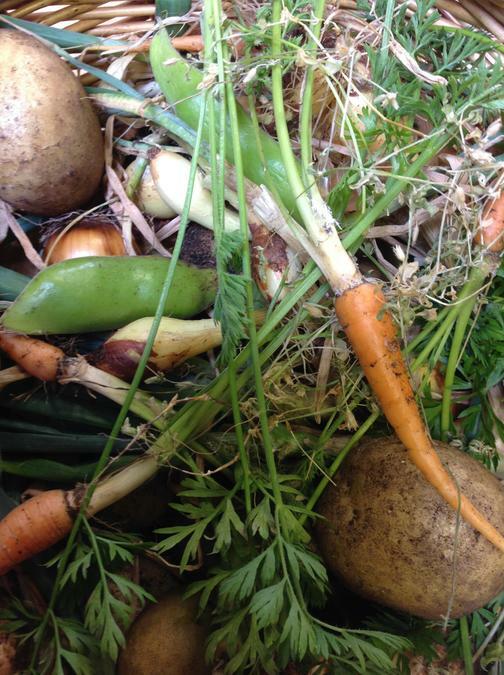 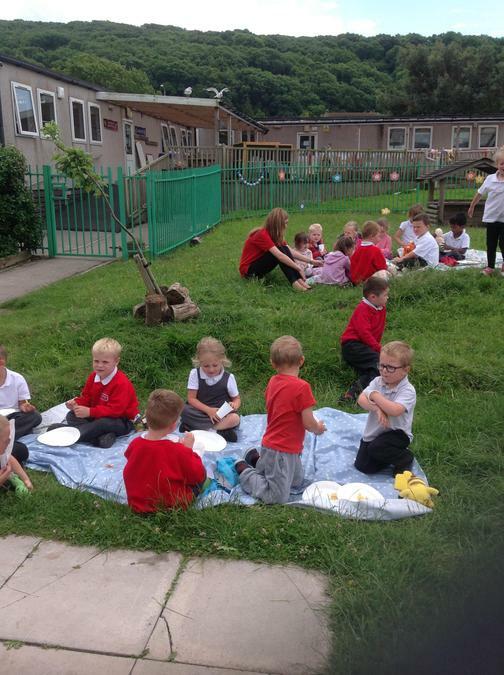 The children have enjoyed following their interests inside and outside together and we got to pick the vegetable that we planted earlier in the year. 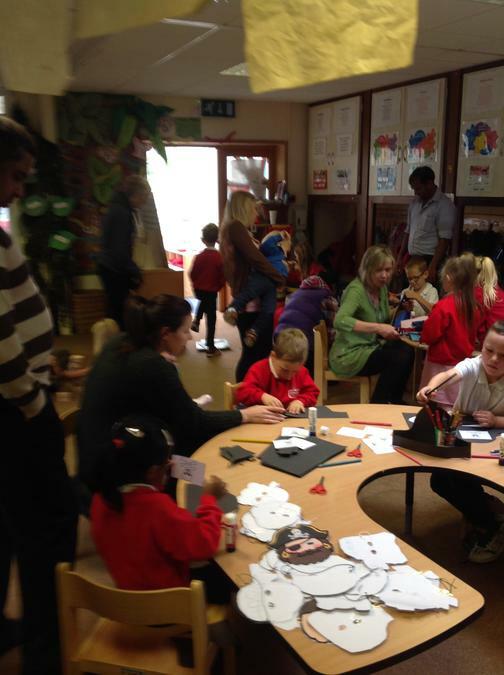 We really enjoyed our afternoon events on Tuesday afternoon and thank you for everyone that came to join us. 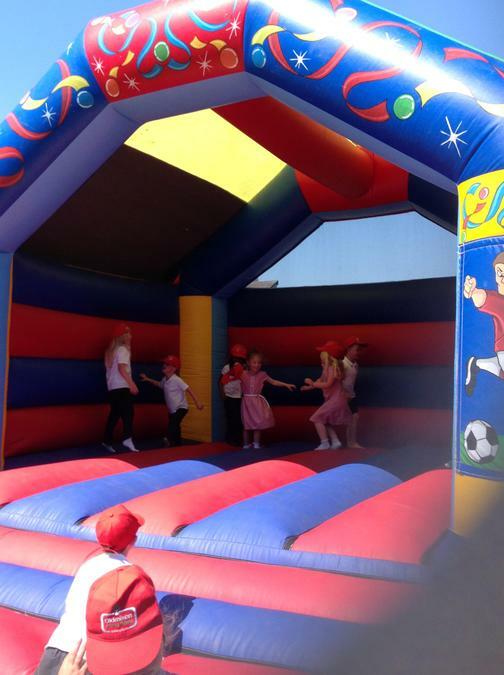 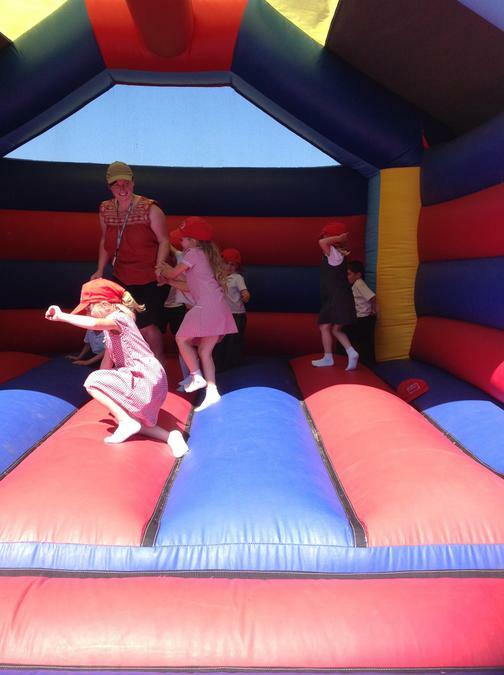 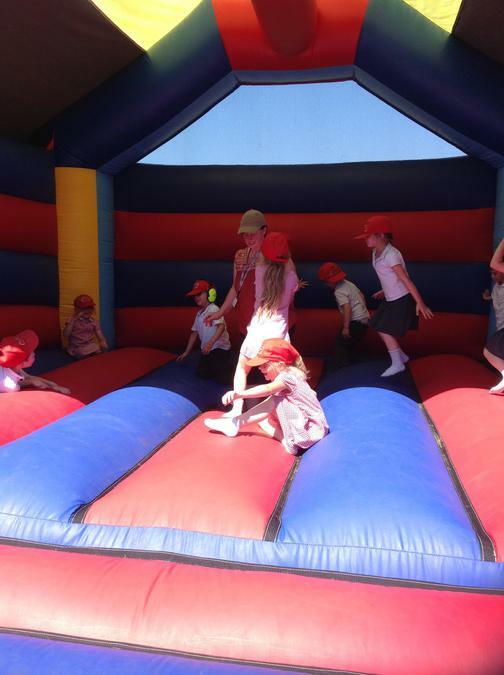 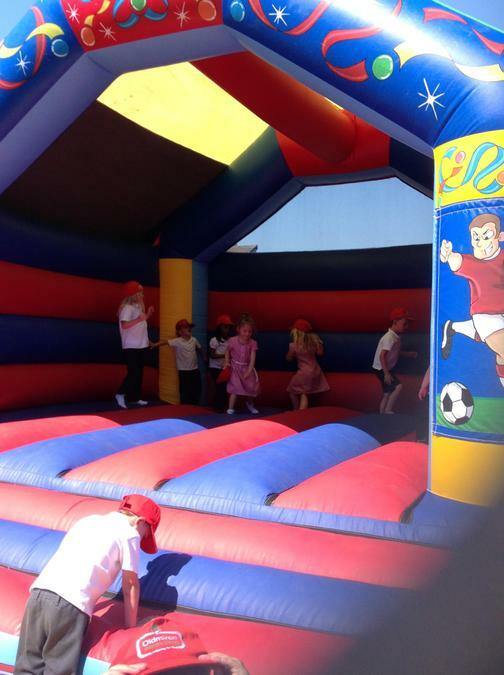 We played musical statues, popping the bubbles, hit the pinjata and got to bounce on a big bouncy castle. 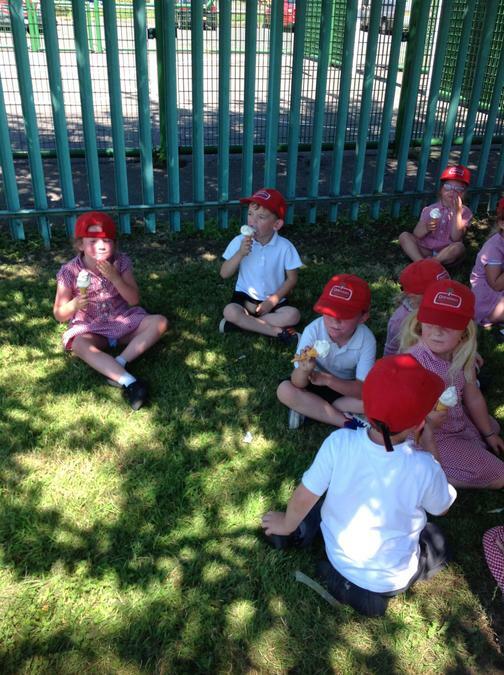 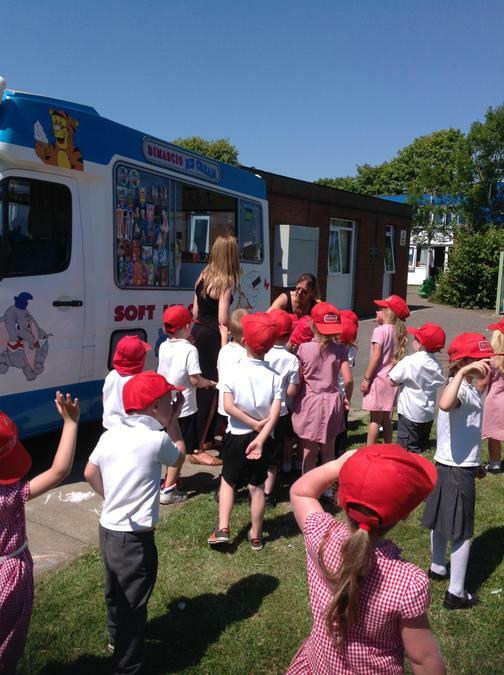 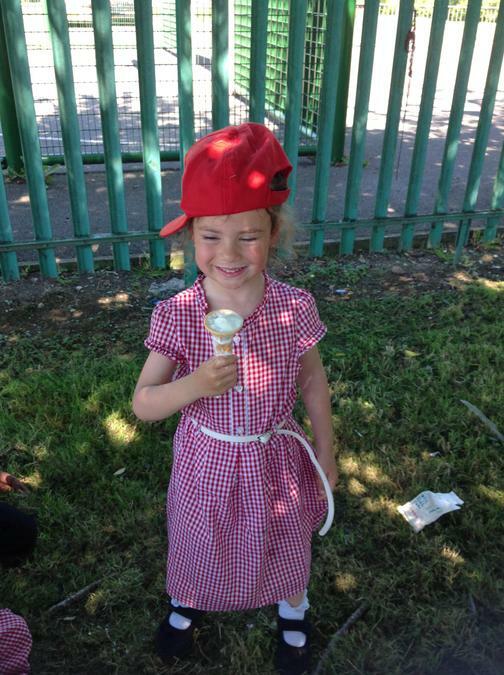 We all enjoyed a picnic lunch together and an ice cream from the ice cream van. 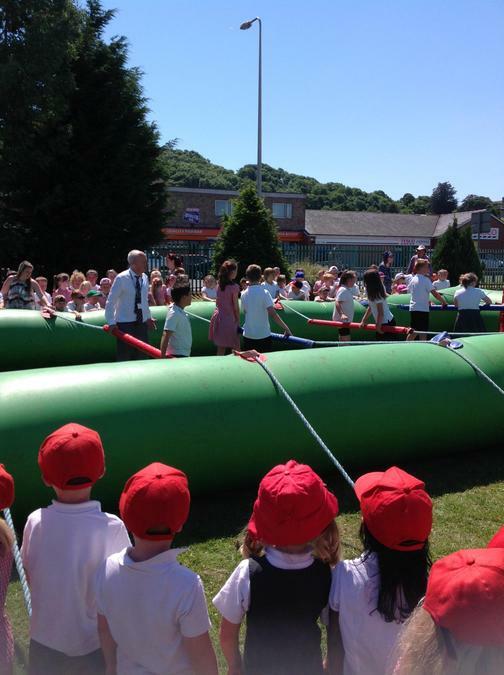 We enjoyed watching Mr Greenwood play on the human football table! 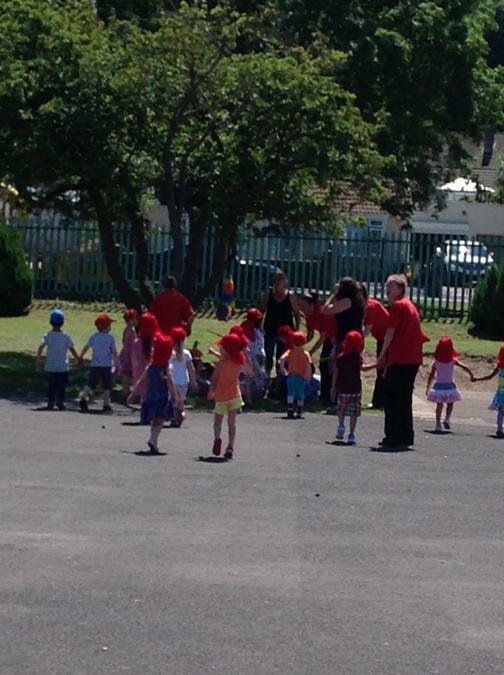 Thank you for all your support over the year. 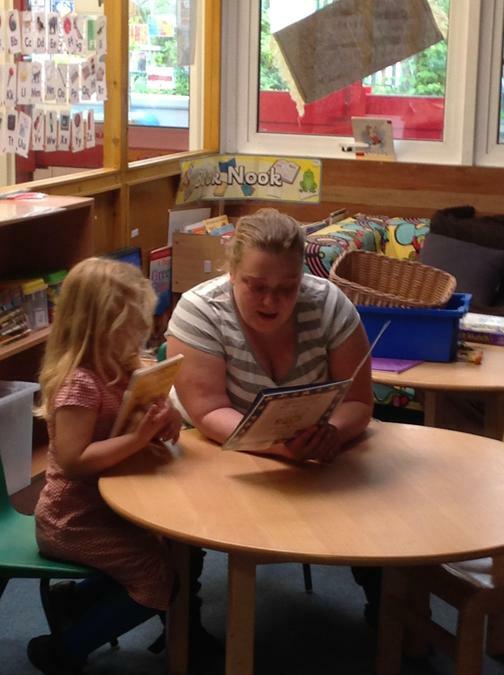 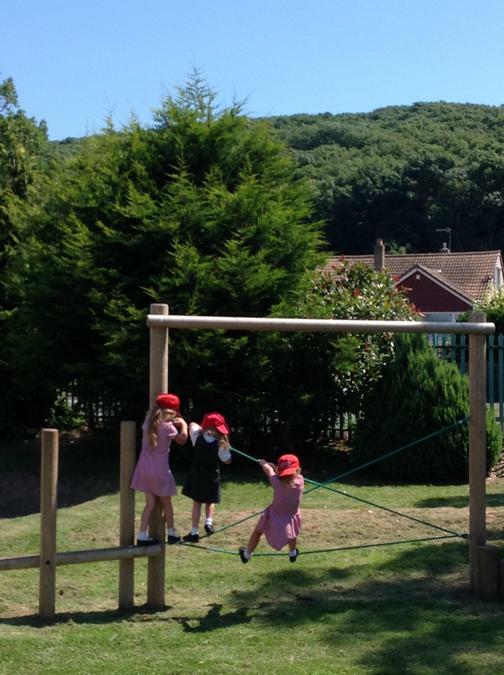 it has been a pleasure to watch your children settle into school and grow in confidence and their learning, ready for year one. 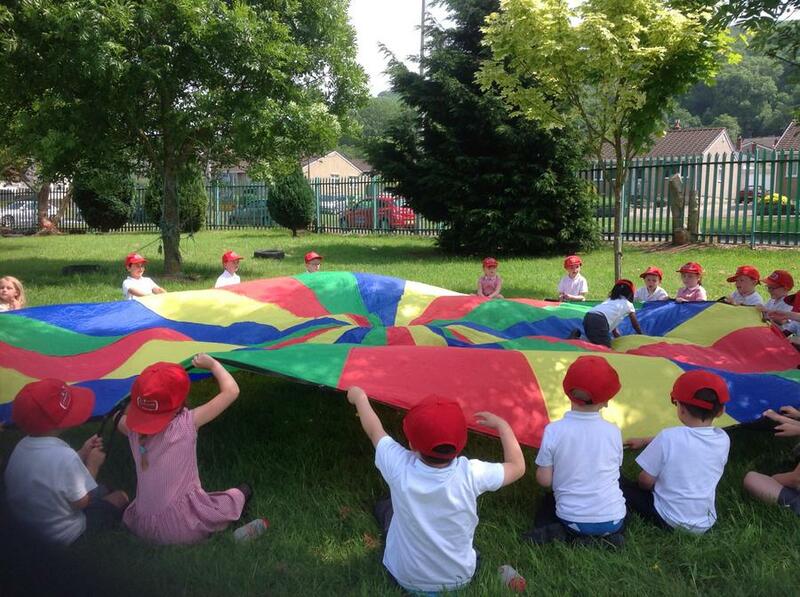 Have a fantastic summer holiday and see you in September as they start their year one journey. 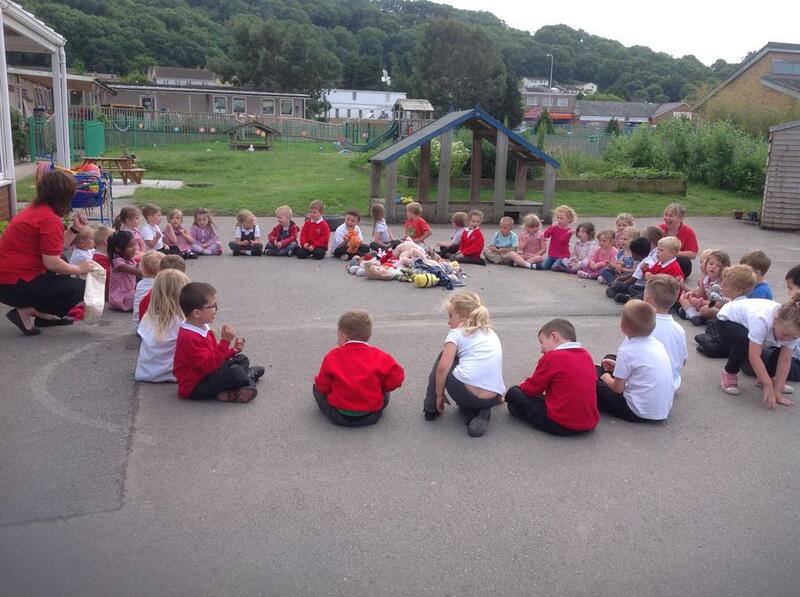 This week we have celebrating our learning over the last year and working together. 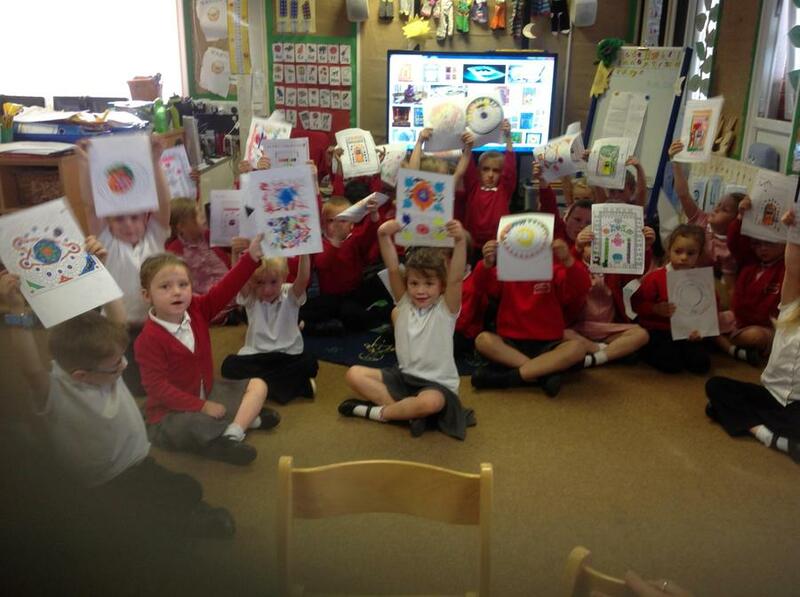 We have made our own passports to go to year 1 and show our interest for Miss Walton. 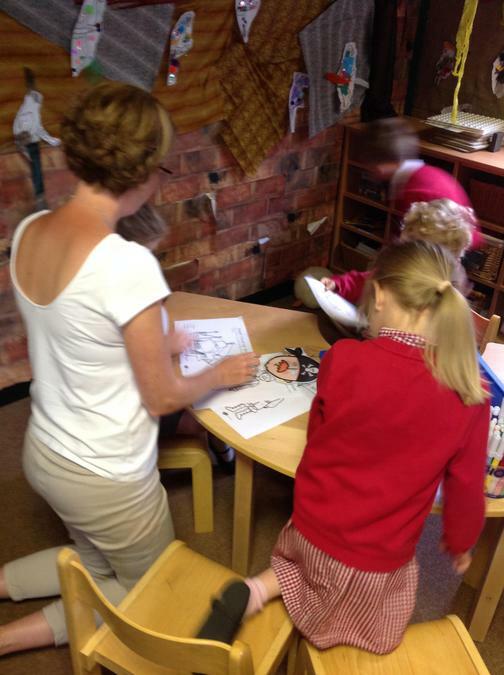 We have also enjoyed experimenting which liquid would age paper to make pirate maps. 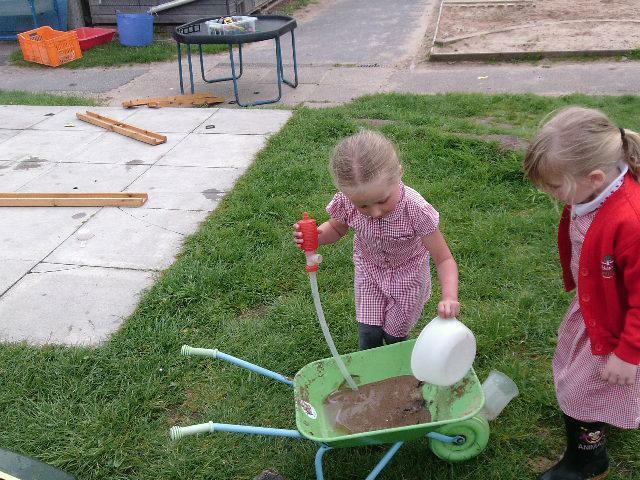 We used tea and coffee and found that the coffee gave the best effect. 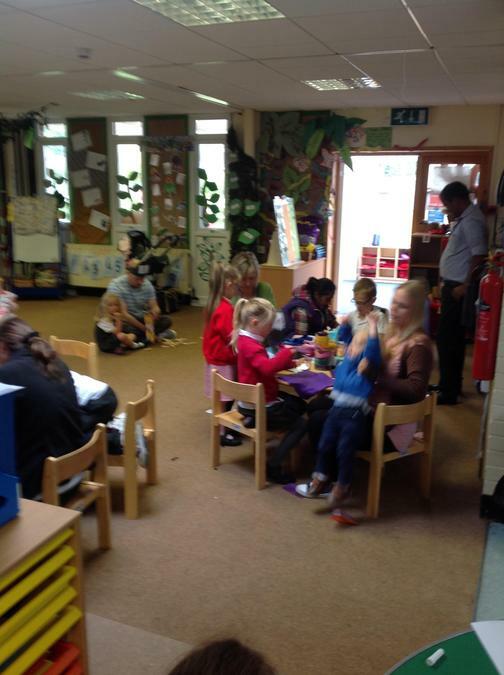 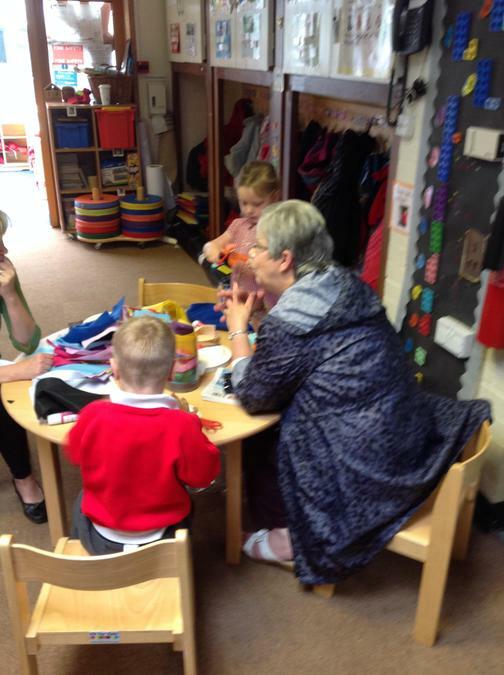 We really enjoyed having everybody in our classroom on friday morning, we shared our activities and games. 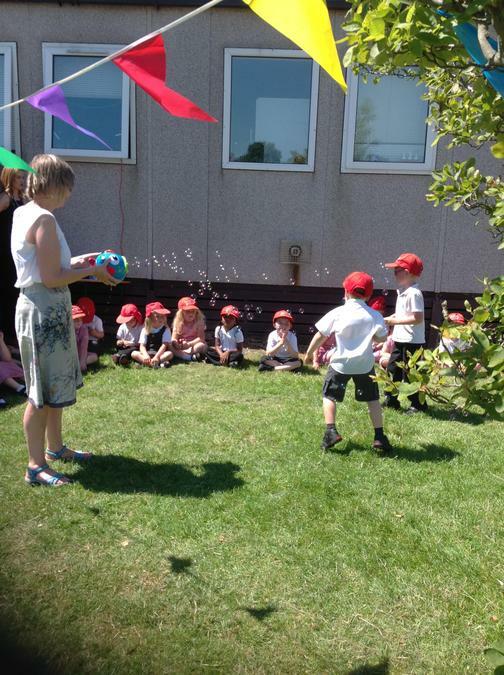 We hope everyone enjoyed sharing their year in reception with our last slideshow of the year. 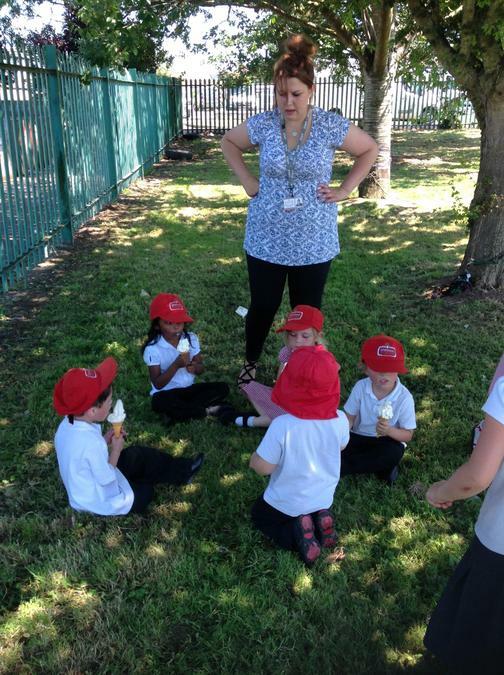 Here are a few photos from the start of the year, let's see how much we have changed. 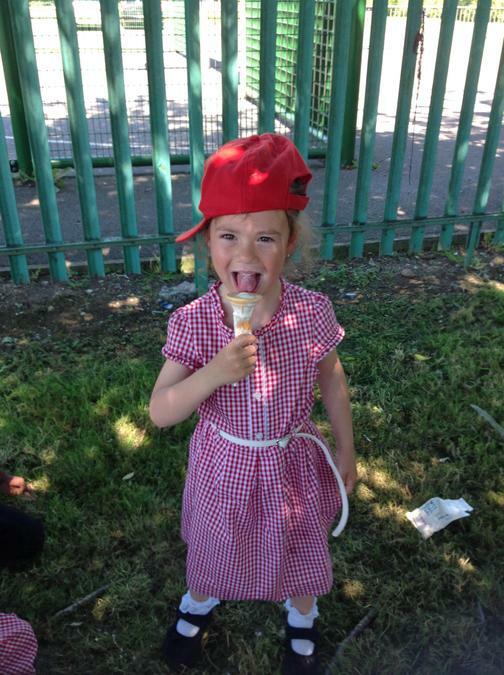 This week we have had sports week, reception class have had a very exciting and busy week. 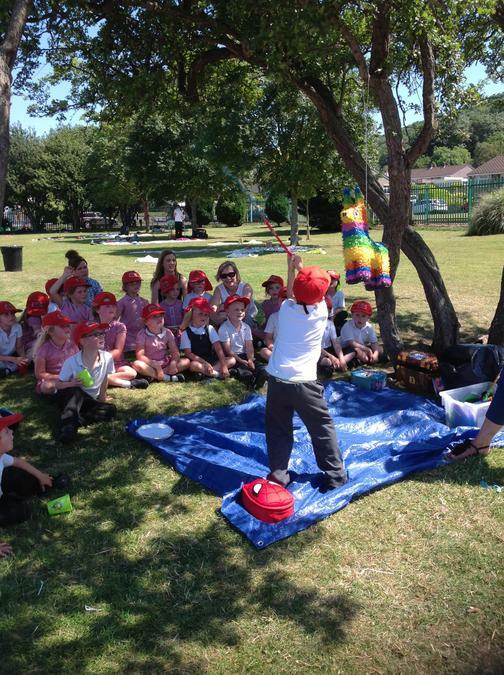 KS1 went to the water park and had lots of fun exploring the castle, swings, zip wire, sandpit and of course the water. 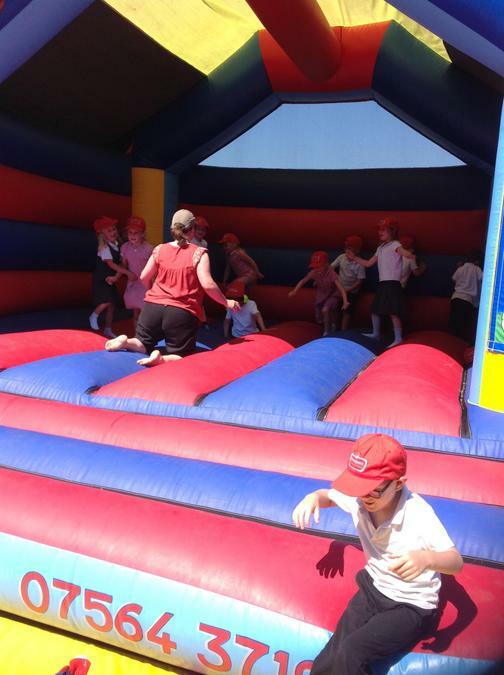 The children were very well behaved and really represented Oldmixon school well. 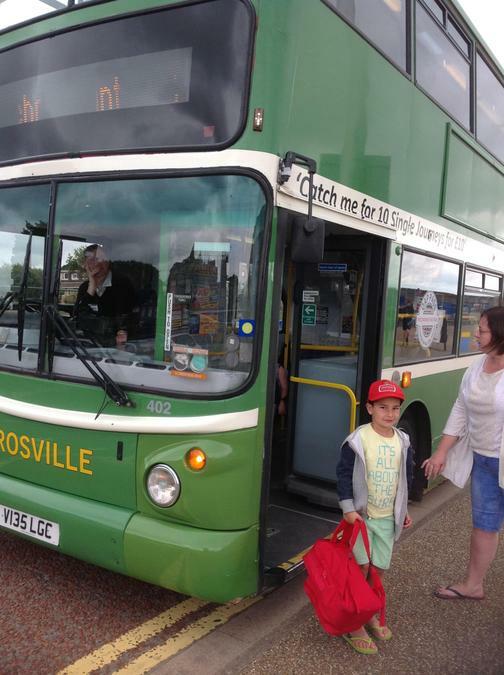 The children had lots of fun travelling to the water park in a coach and then getting to travel back in a double decker bus. 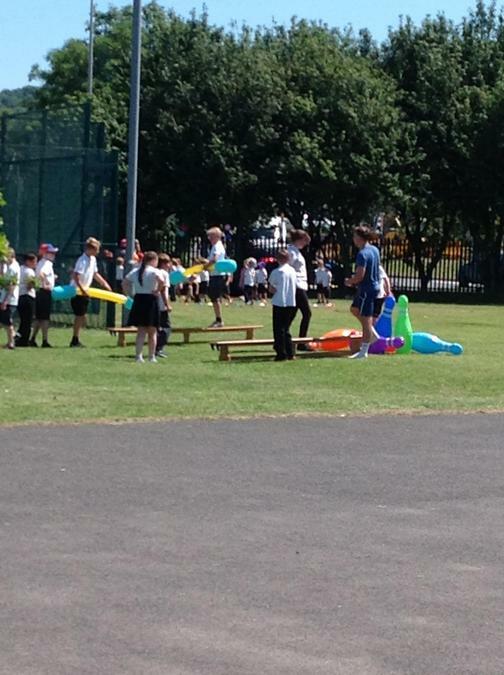 Once the sun came out we got to explore in the water, this was super fun and we tried to get all the teachers wet too. 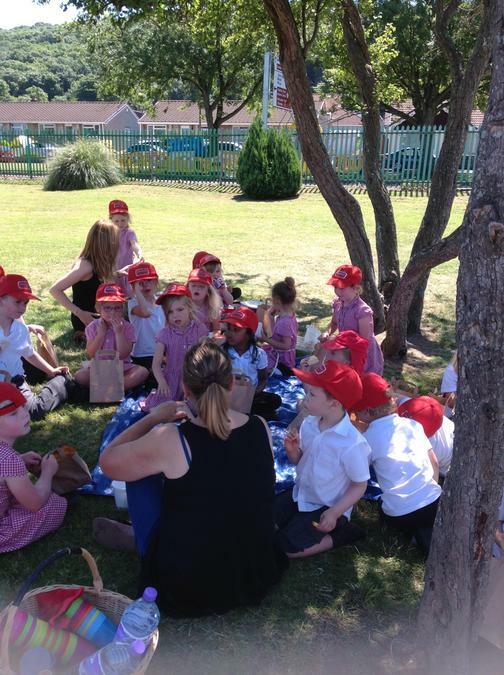 We then had our lunch in picnic style and then off we went to see the rest of the school at the beach. 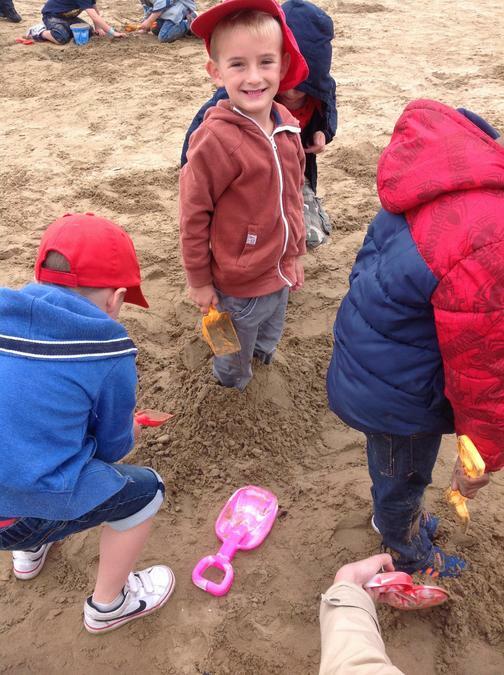 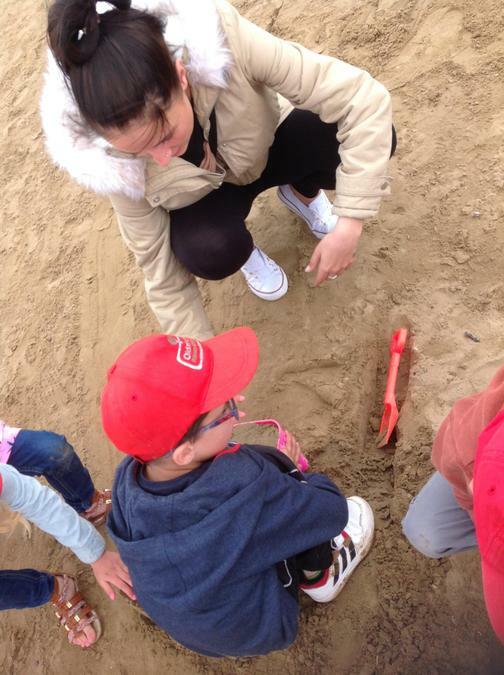 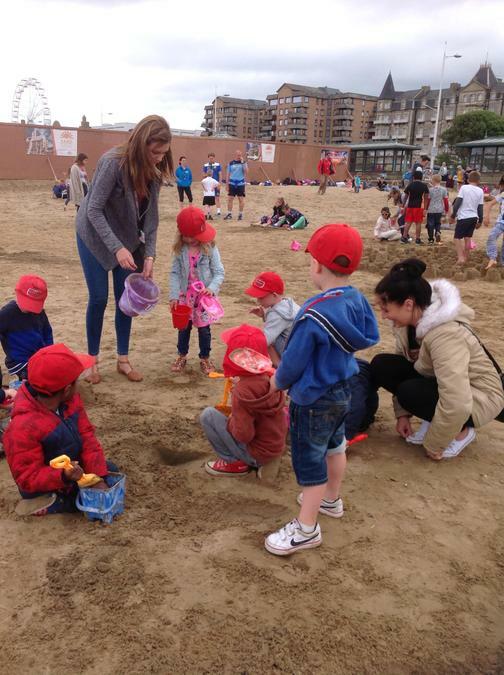 We had lots of fun making sandcastle and some of the parent came and joined us on the beach too. 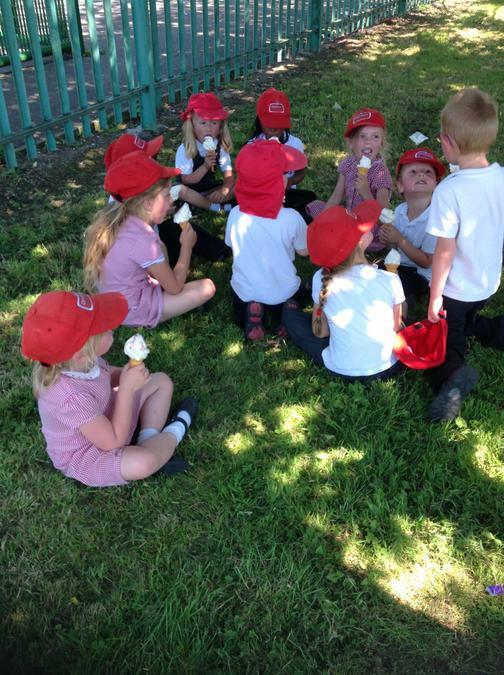 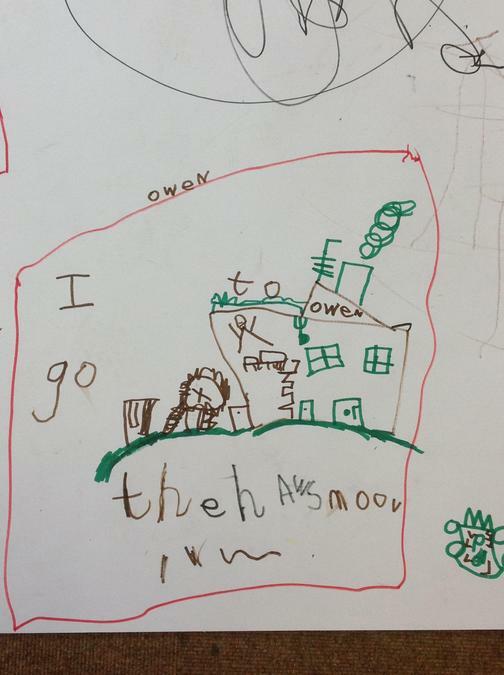 Reception had a very exciting day. 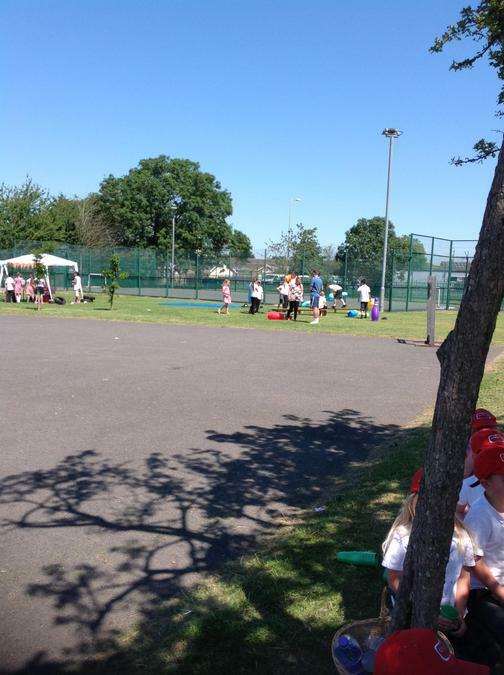 Reception had their sports day which was a great success, thank you to all the parents, friends, grandparents and family that supported us on our sports day. 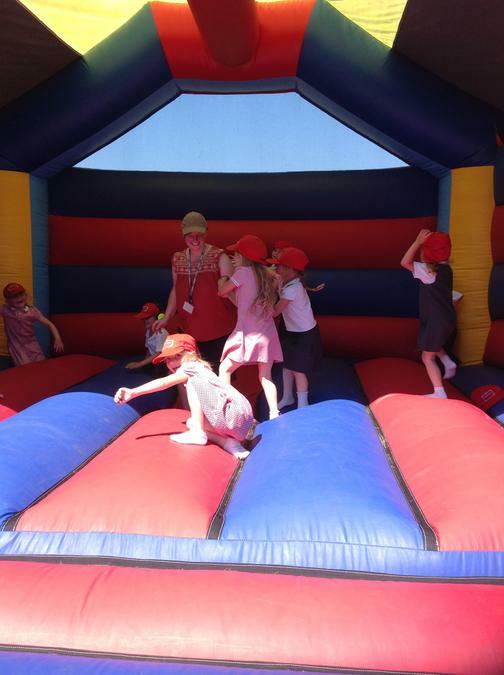 The children had lots of fun and enjoyed taking part in sports day, we had lots of fun showing our skills. 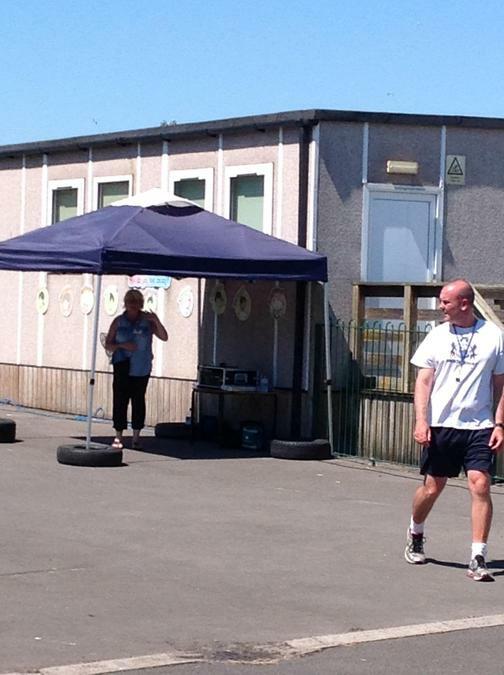 We did lots of races such as; running races, relay races, obstacle race and bat and bean bag race. 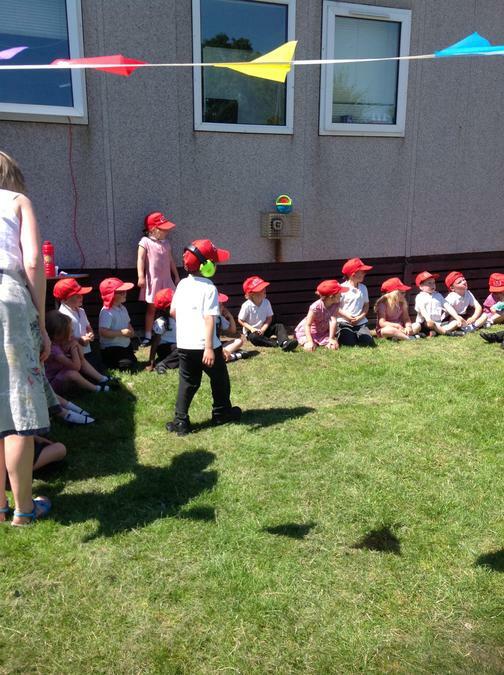 All the children were given a medal for their brilliant sportsmanship. 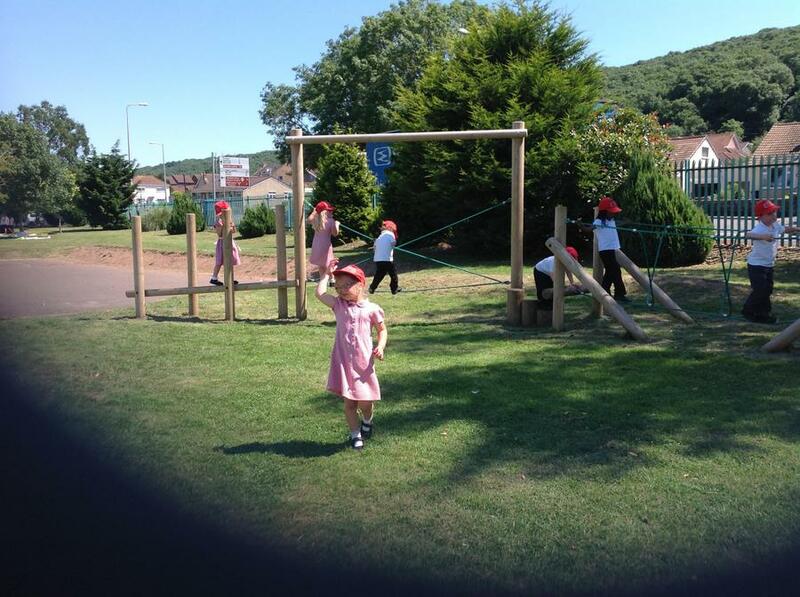 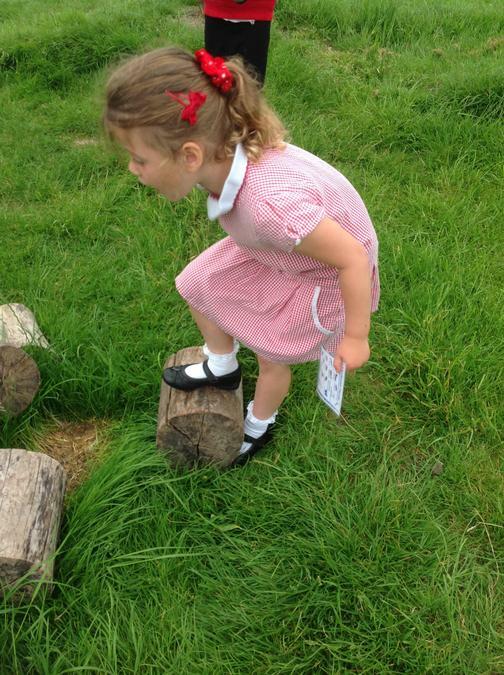 Reception have also been exploring the big playground, we all went up to the play equipment and had a try. 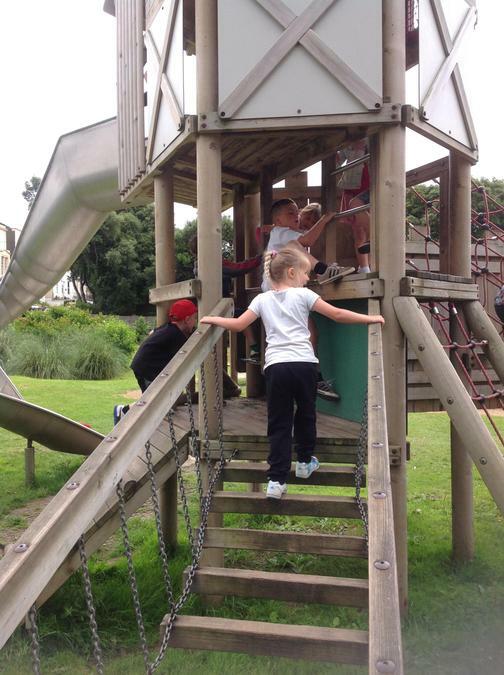 This was fun but challenging as we are not as tall as the other children just yet, we need to grow more over the 6 weeks holiday. 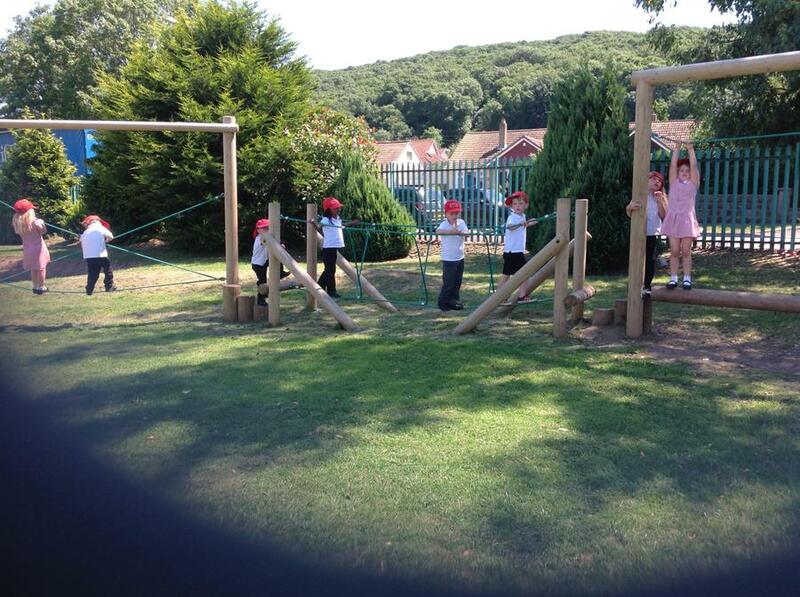 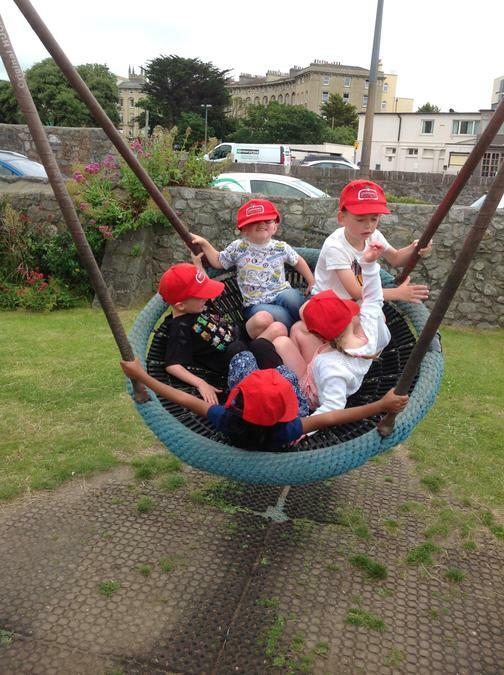 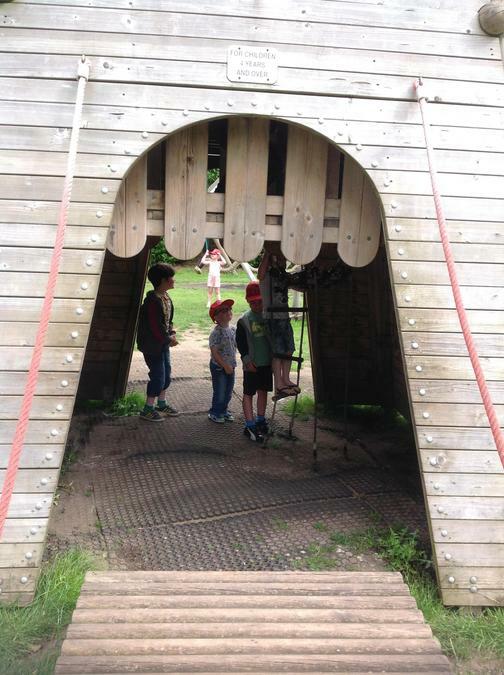 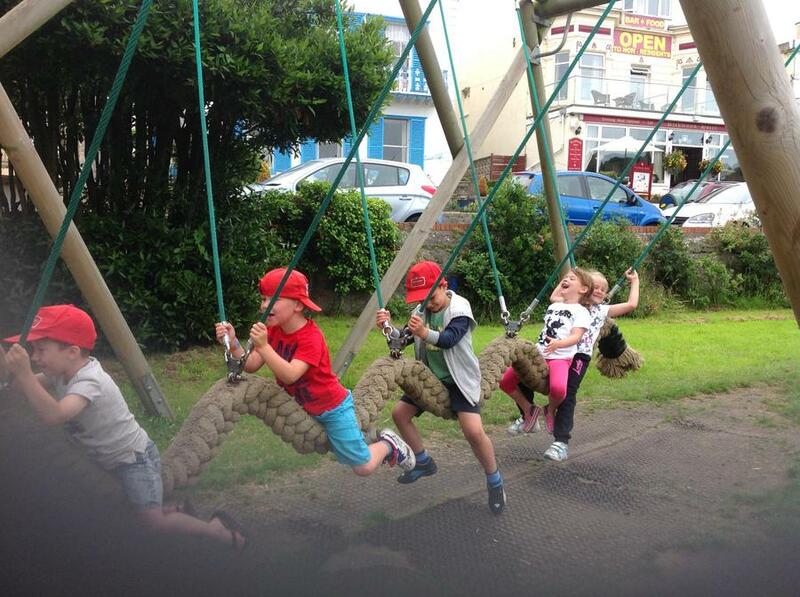 Some children were able to try the whole climbing frame but were tested on how they were going to achieve this. 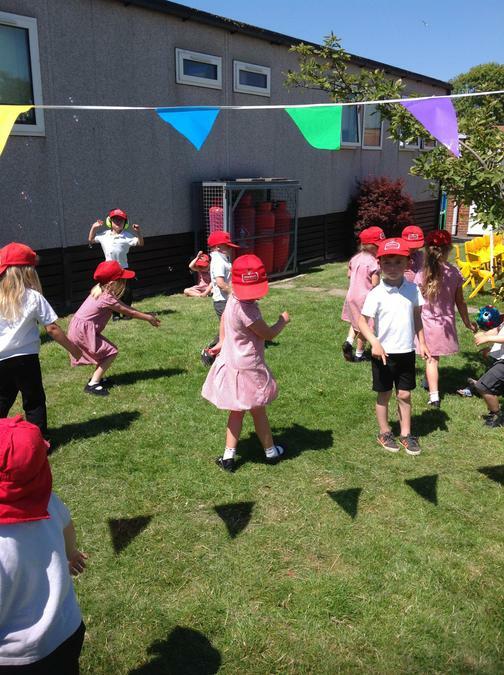 Reception have enjoyed their sports week. 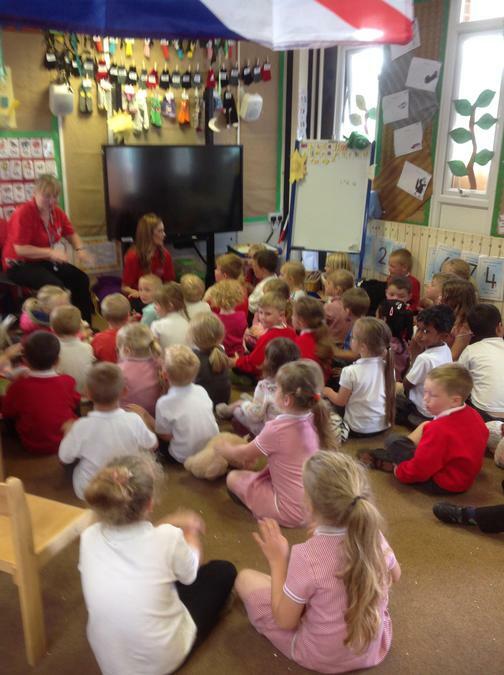 Today we have had Sergeant Collins in our class, Sergeant Collins has payed us a visit before when we were learning about people that help our community. 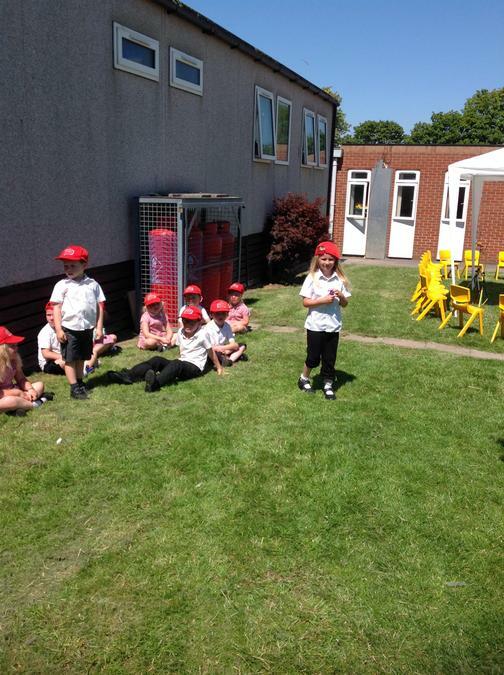 Cassie's dad (Sergeant Collins) told us all about camouflaging. 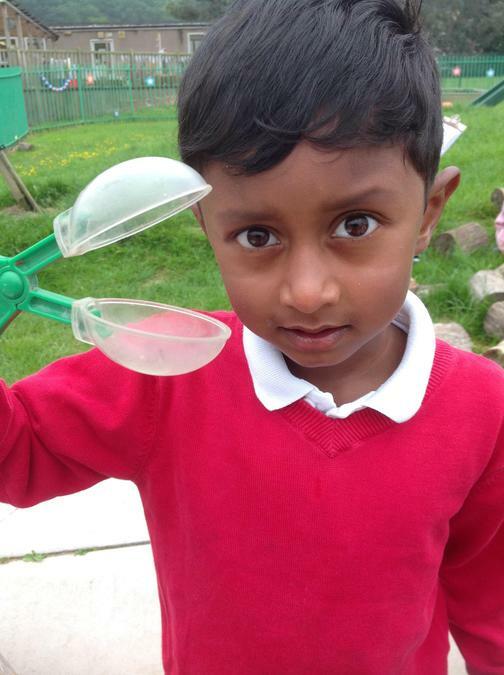 We were lucky enough to be able to try this on our faces. 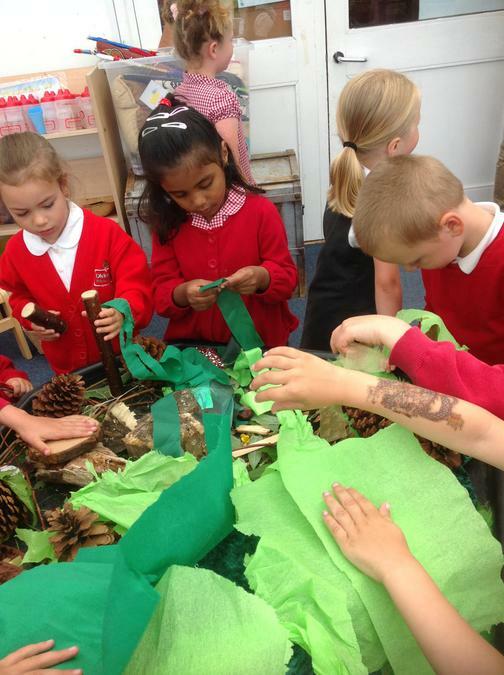 We had lots of fun exploring the colours we could use to camouflage ourselves into the bushes and trees. 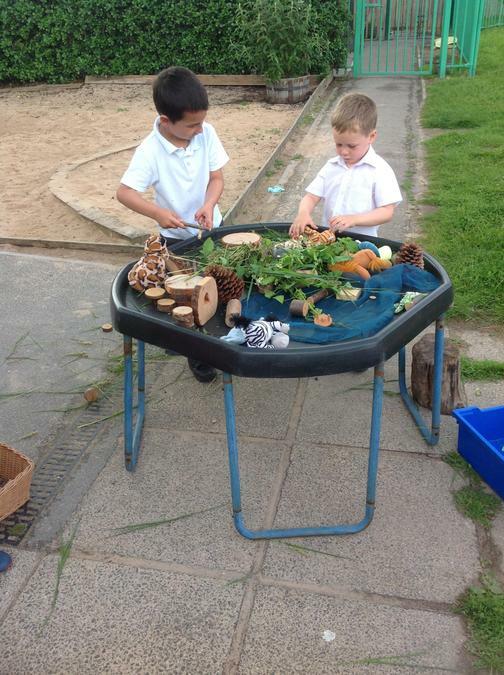 This week the whole school have taken part in an ART week, ​The artist we were inspired by was Andy Goldsworthy, we had a look at his work and this inspired us to make our beautiful pictures. 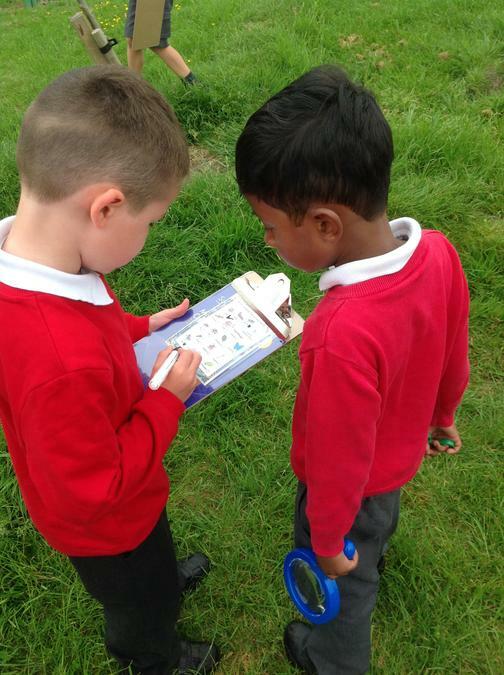 Reception class started their week by exploring the field and finding natural resources to create some pictures.When we were exploring the field we found lots of exciting things like: sticks, leaves, flowers and twigs. 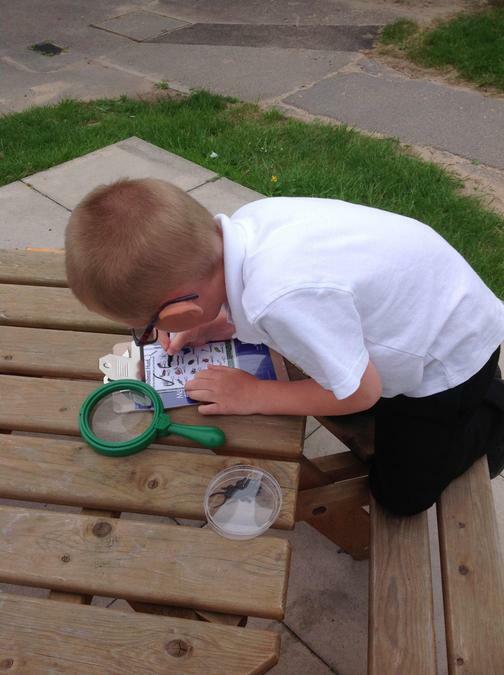 We came back to class and we explored the materials, making them into pictures. This was lots of fun and the children were very engaged. 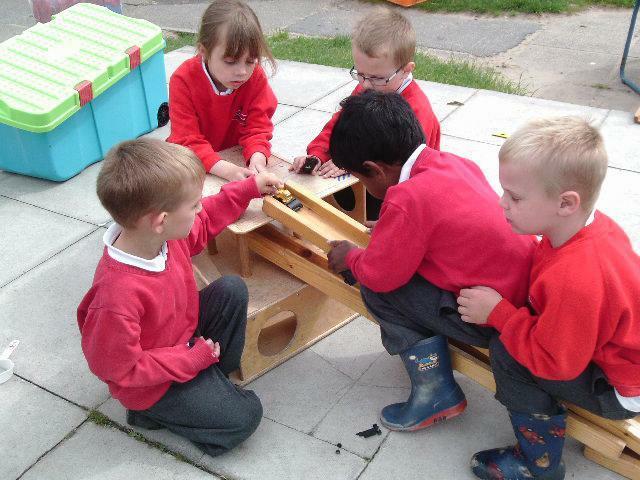 The outcome was very interesting to see, we had some houses, animals and boats. 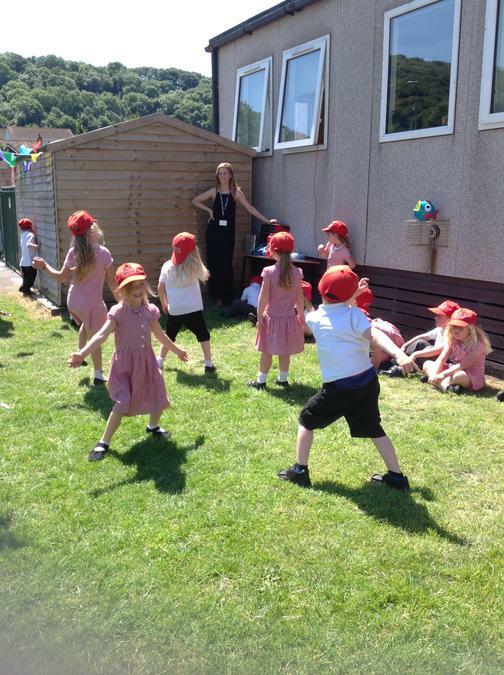 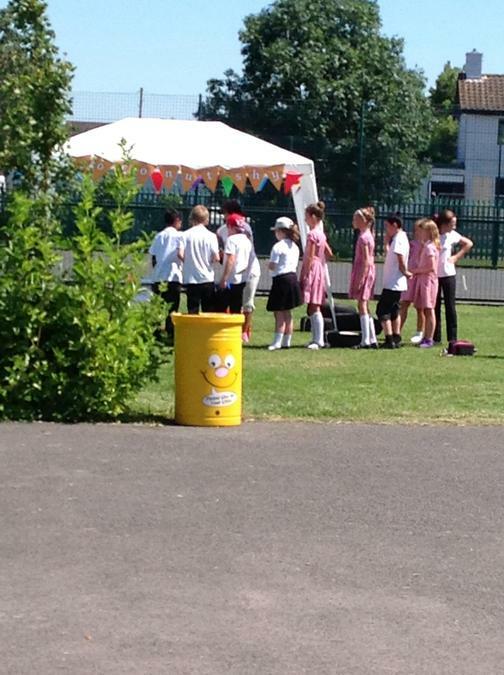 We have also carried on practising for our sports day which we are very excited to show you. 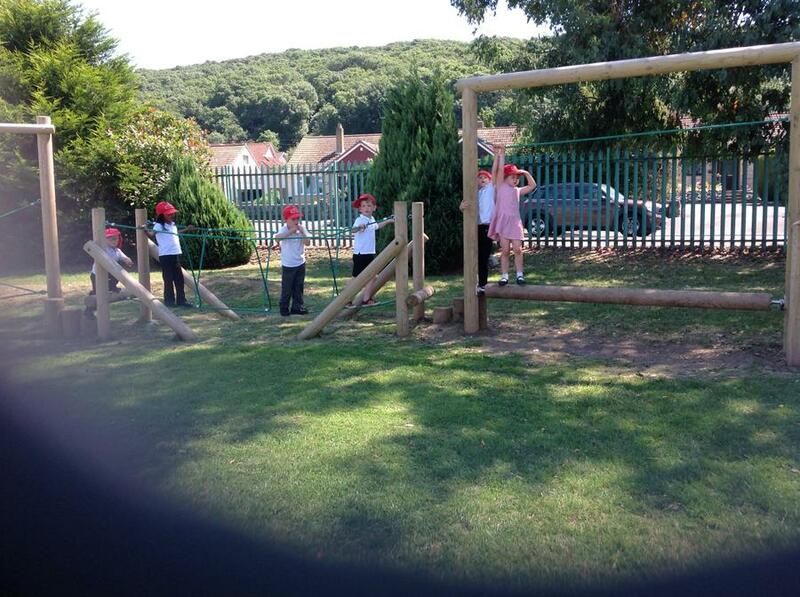 Our favourite thing so far is the running race, we are very competitive but we also enjoy working as a team. 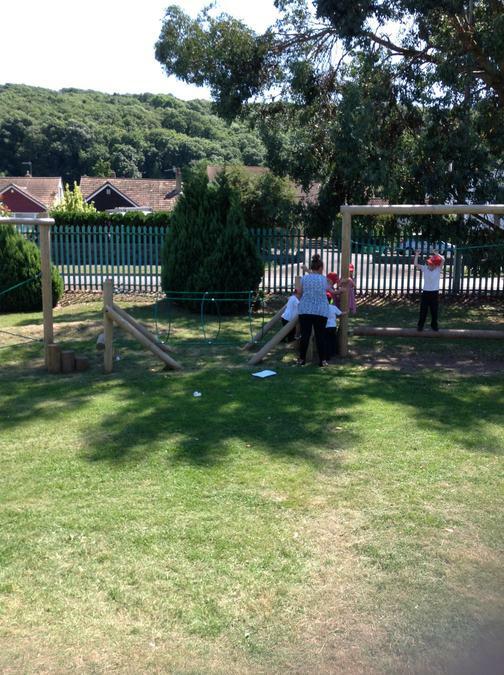 Teamwork is important and the children have been working hard to develop this. 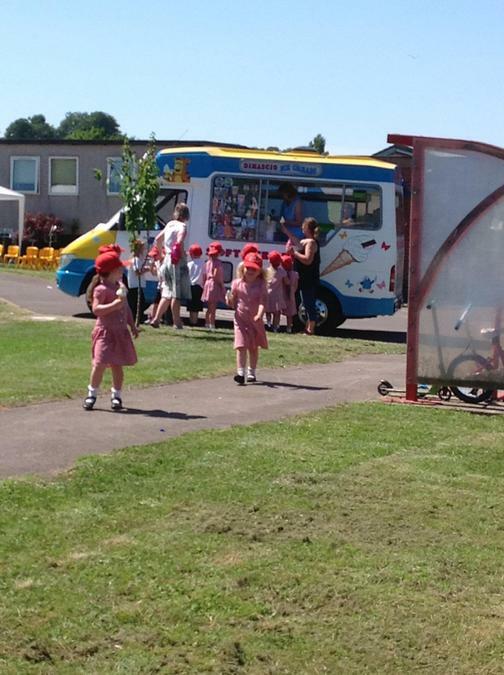 We are excited to see you all on Tuesday 5 July 2016. 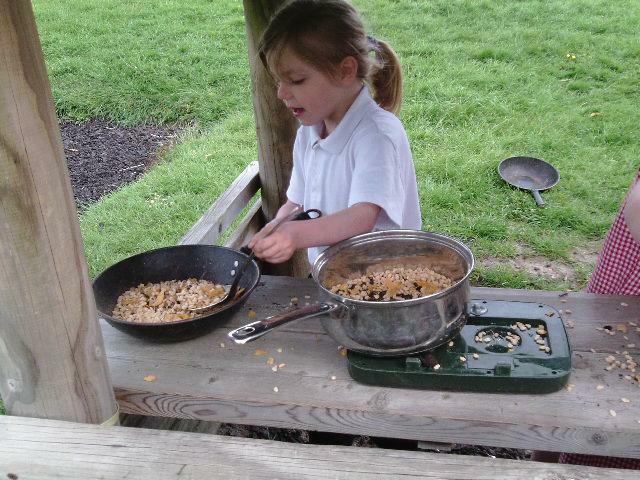 In reception we like to know what the children’s interest are and what they enjoy doing at home so we can incorporate this into their learning; this week Ellie was kind enough to bring in her pea pods which she has been growing at home. 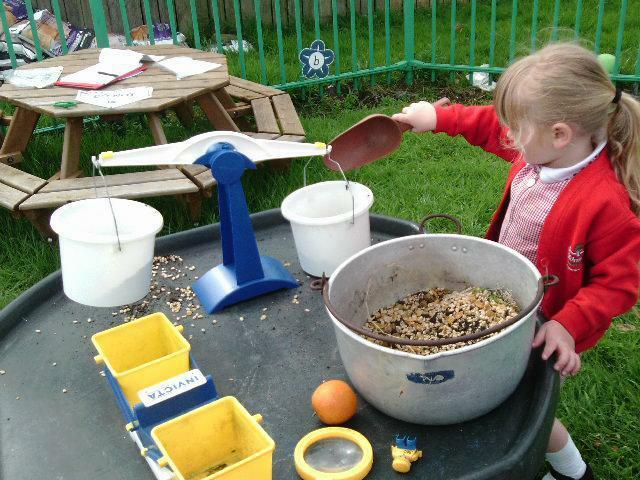 We had chance to feel these and see what they looked like inside, in reception this year we have also grown are own pea pods however ours have not grown as well as Ellie’s. 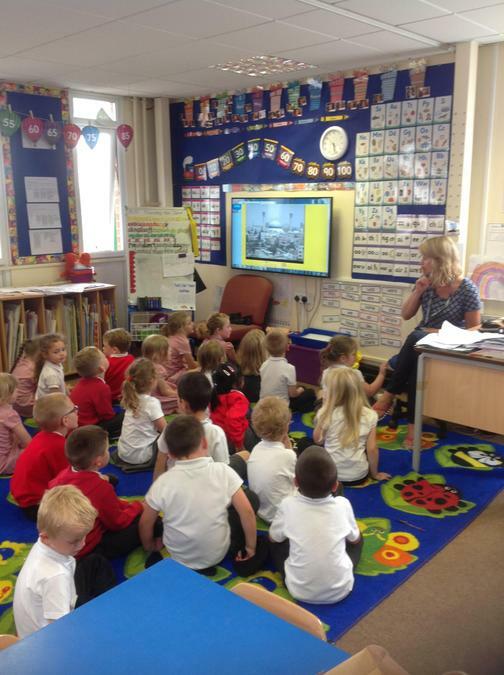 This week we have carried on exploring the Rainforest, we have created a class book on Rainforest animals. 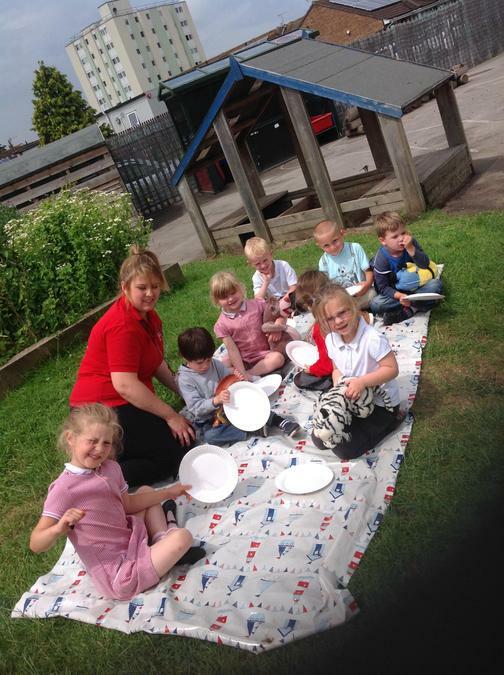 The children enjoyed finding out information about the animals and writing about what they look like, where they live and what they might eat. 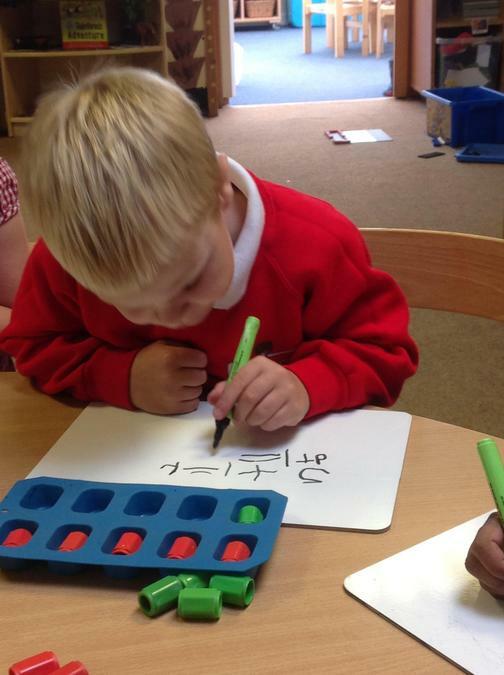 This week in numeracy we have been looking at 'number snakes' counting forward and backwards. 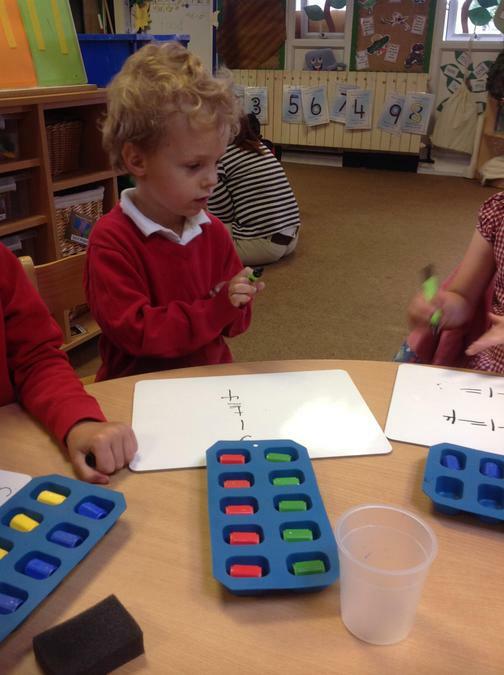 The children had lots of fun learning in this way, they were challenged to complete the missing boxes of the snake using numbers up to 20. 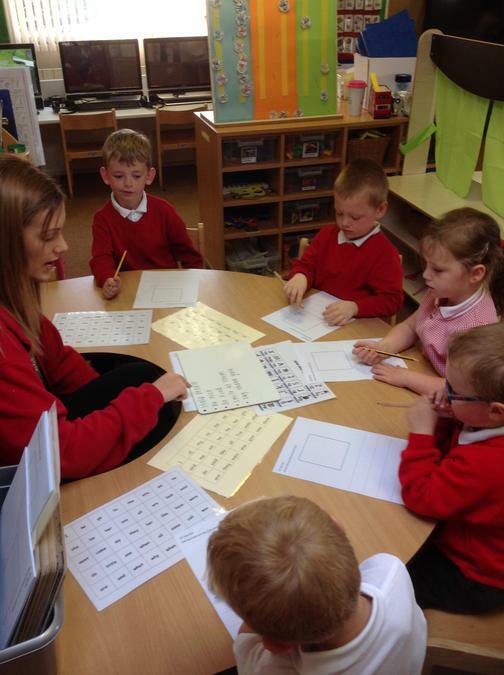 They also had a go at completing the 'jungle number squares' which challenged them up to the number 100. 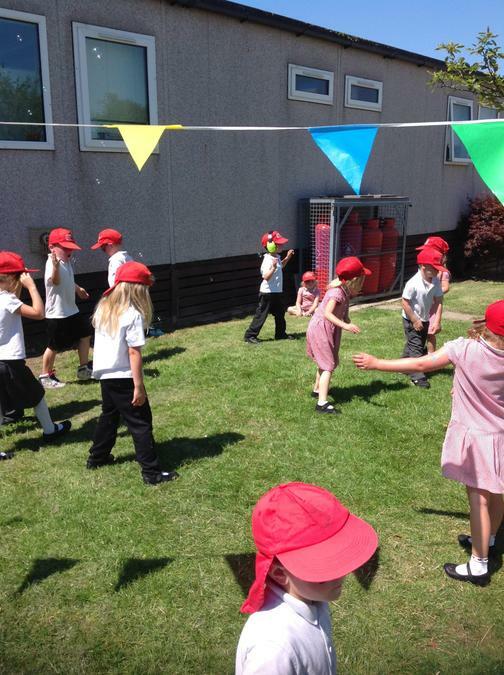 This week we have been practising for Sports Day on the 5th July. 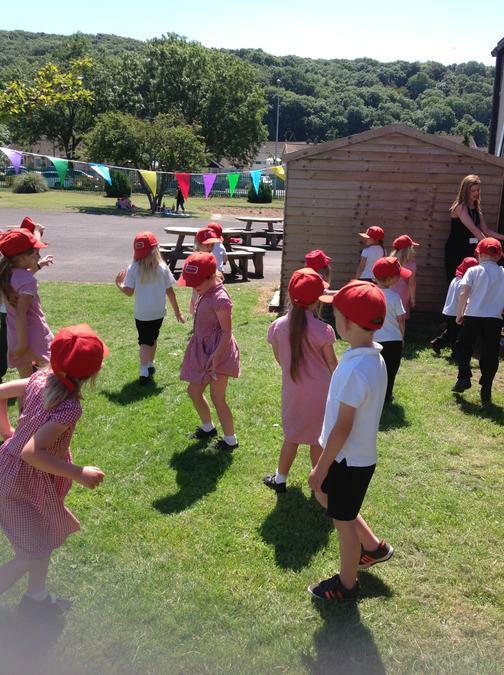 We have had lots of fun practising all the different races such as: Relay race, running race, bat and ball race and balancing games. 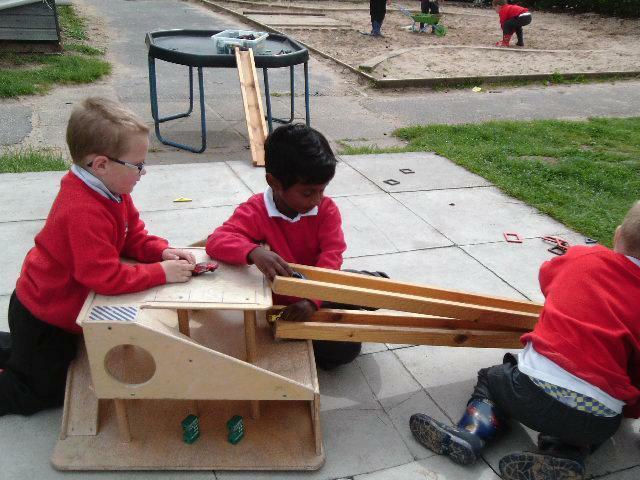 We have been trying hard to work as a team and to show support to our team members. 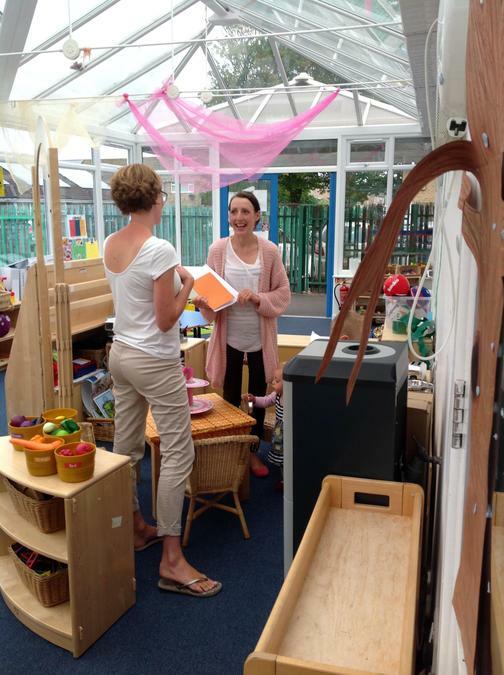 We are looking forward to showing you! 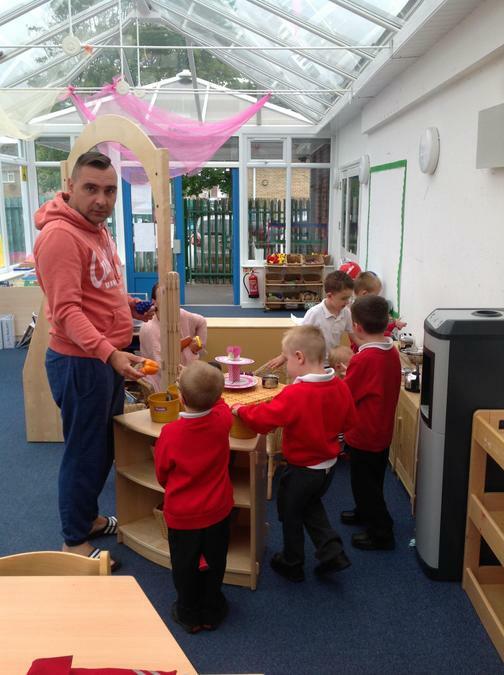 On Friday we had a creative day which included making parrots and sock snakes, We had lots of fun exploring the different material we could use for a parrot. 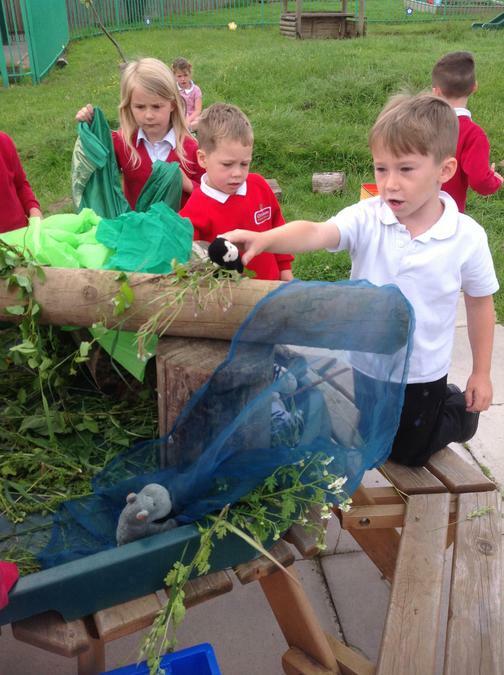 These parrots are now part of our Jungle/Rainforest within the classroom. 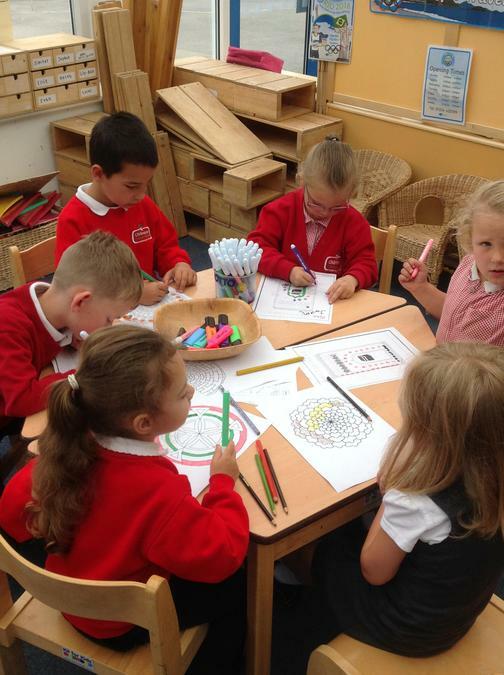 We also enjoyed making 'sock snakes', we placed the socks on our arms and decorated these with: eyes, silking material and glitter pipe cleaners. 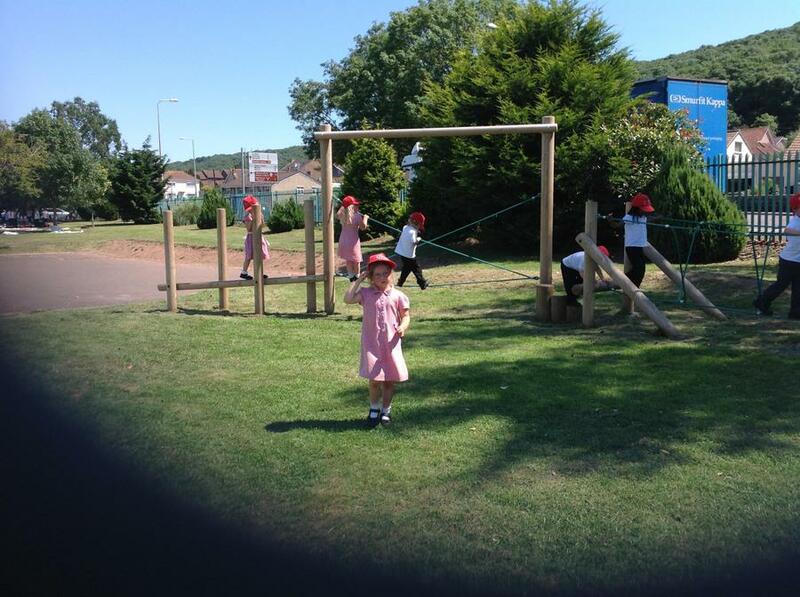 We are enjoying exploring the Rainforest. 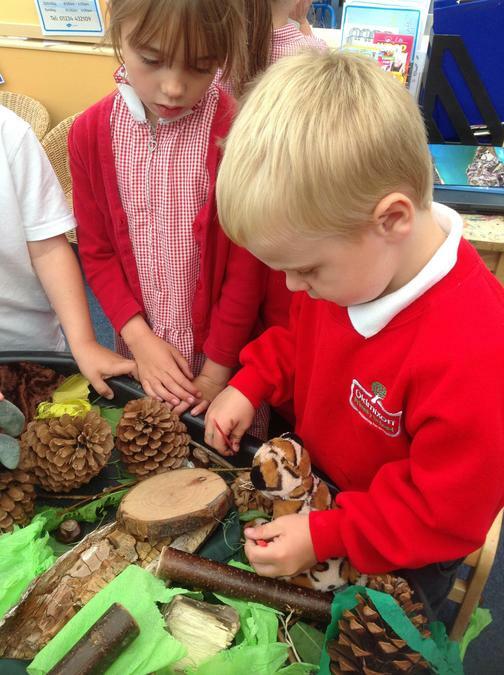 This week we have started to explore the Brazilian Rainforest – researching what it looks and sounds like and how it might feel to be in there. 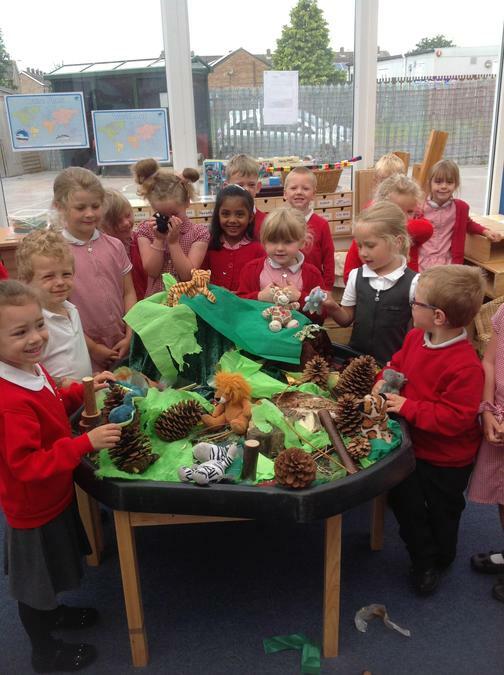 The children really enjoyed gathering resources and building their own Rainforests for all the animals in the Rumble in the Jungle poetry book that we have been learning. 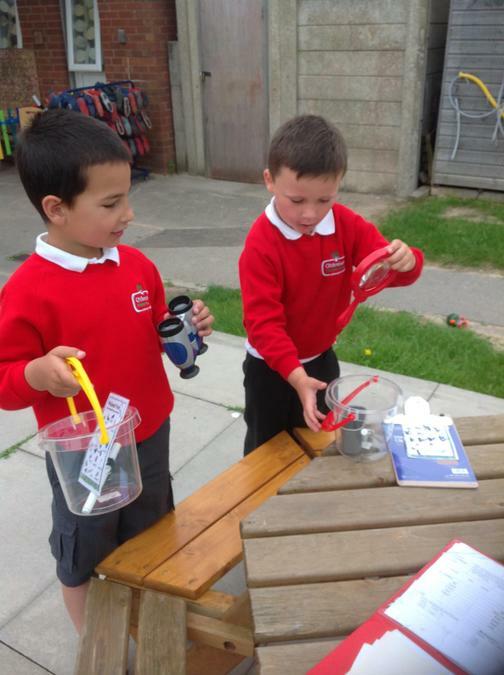 We have written descriptions about what the Rainforest looks like and what animals you might find in there. 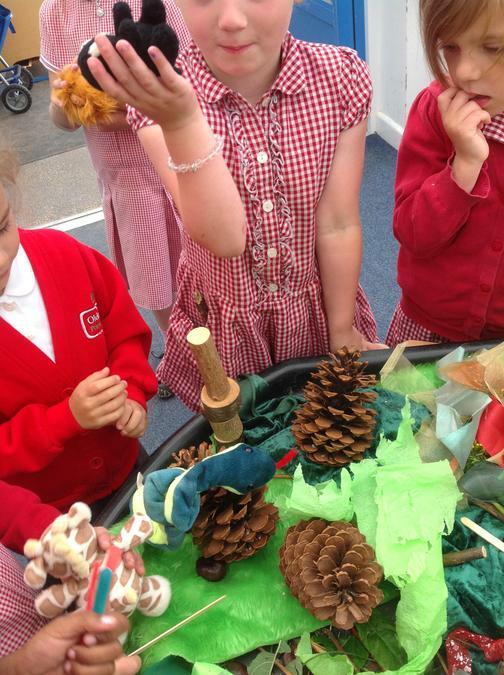 We also created our own Rainforest creature. 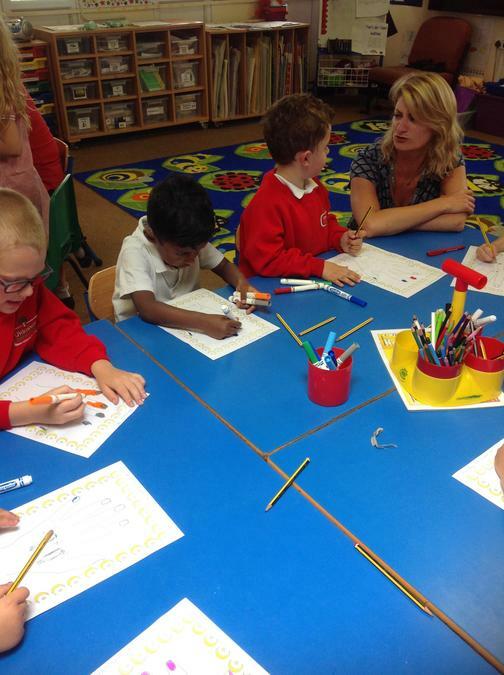 We drew and named the animals from Hissatoos, Spikey Snakes to Peekacok’s! 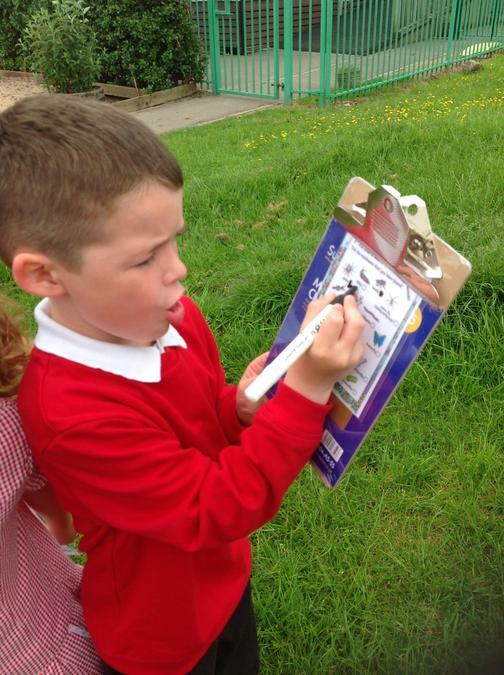 Then we wrote a description about the animals; from where they lived, what they liked to eat and do and what colours and textures they were – just in case you saw one on your travels! 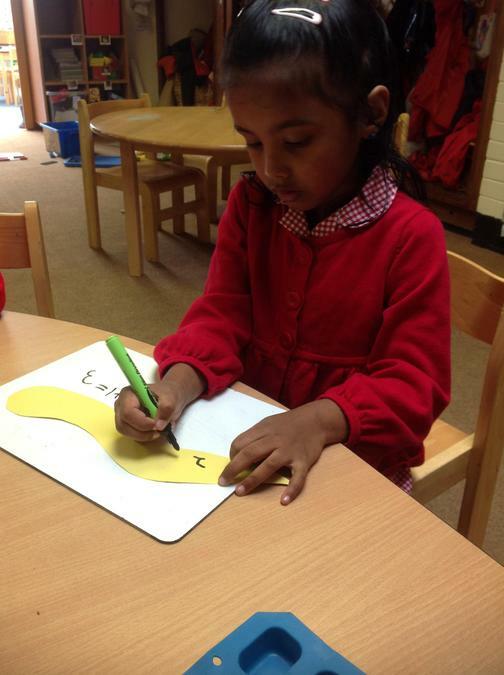 We have made some ‘number sentence snakes’ to live in our growing jungle with the reflections butterflies. 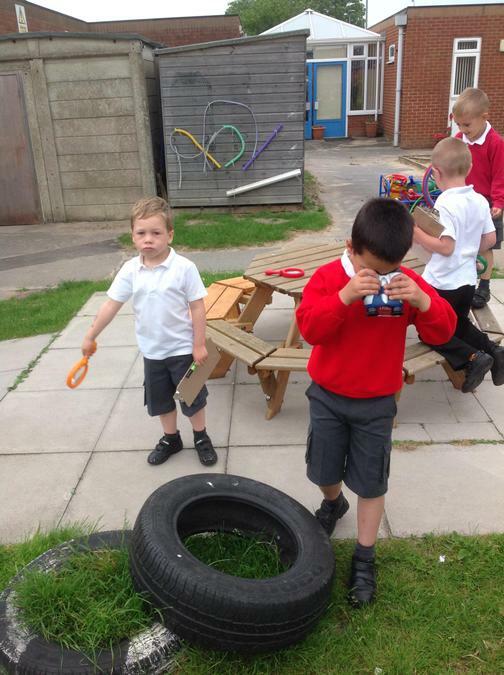 The children enjoyed creating their own number sentences using objects to add and subtract two groups together before recording them on a wriggly snake. 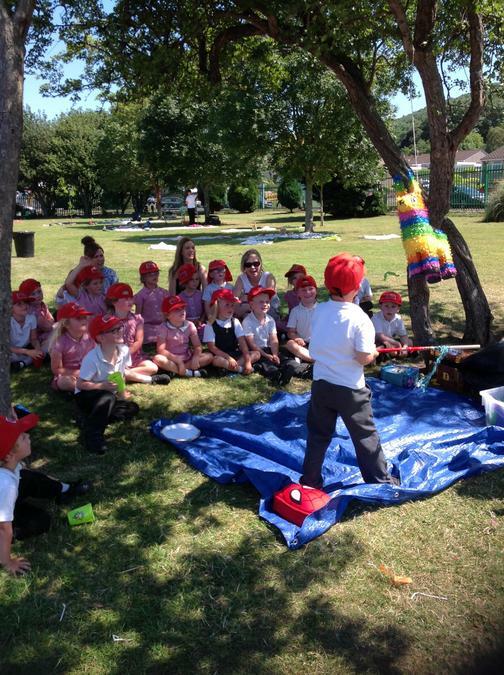 On Friday afternoon we got together with some of the children from Nursery coming up to the Reception Class on September for a Teddy Bears picnic. 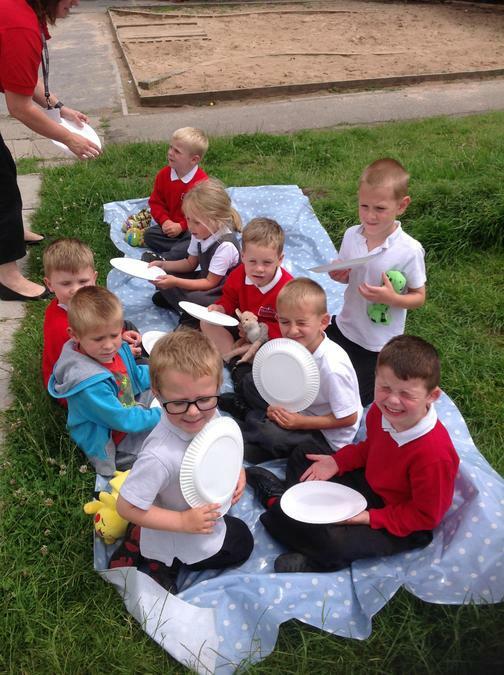 There were sandwiches, crisps, cakes and squash. 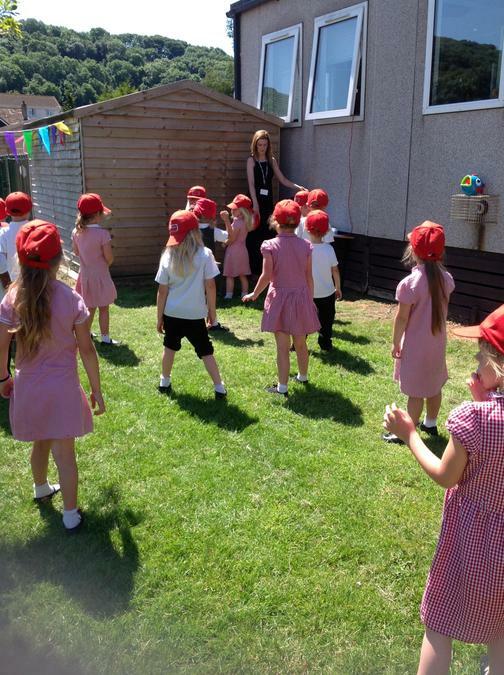 We sang some songs, played some games and the nursery children taught us the story of 'Going on a Lion Hunt'. 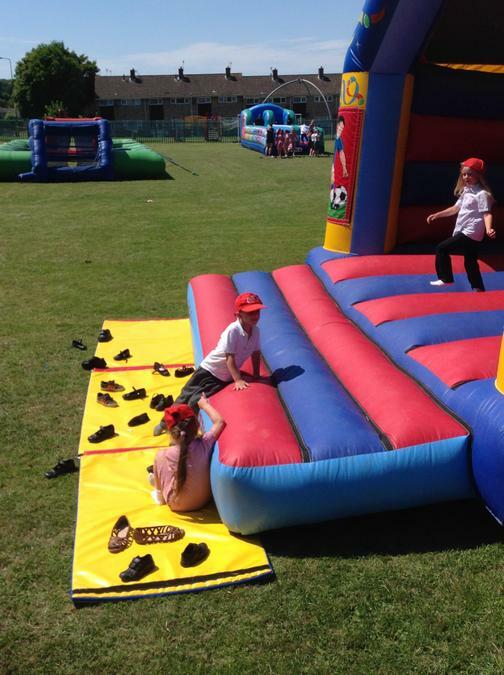 This was all to enjoy some time together as well as raising some money for the Childhood Eye cancer trust. 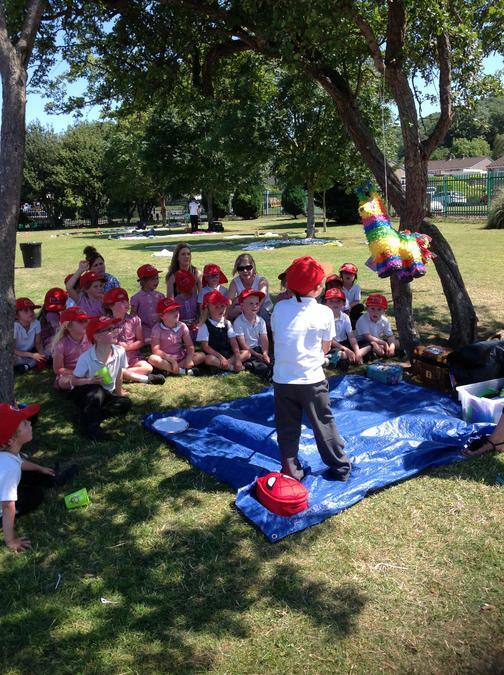 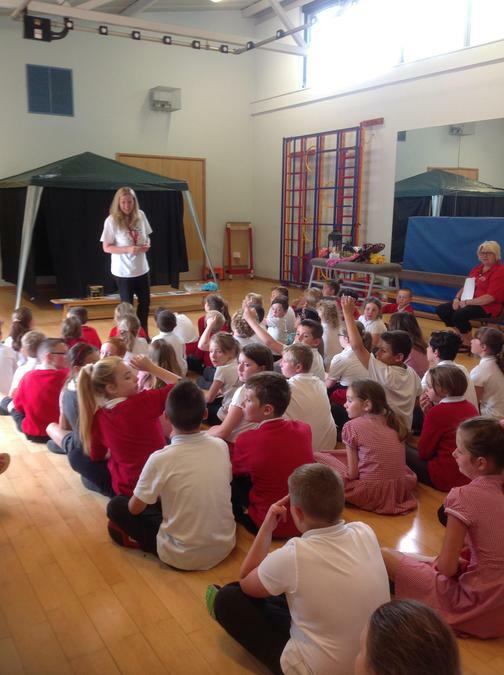 Next week we are off on a safari to find more out about the creatures that live in the Amazon Rainforest. 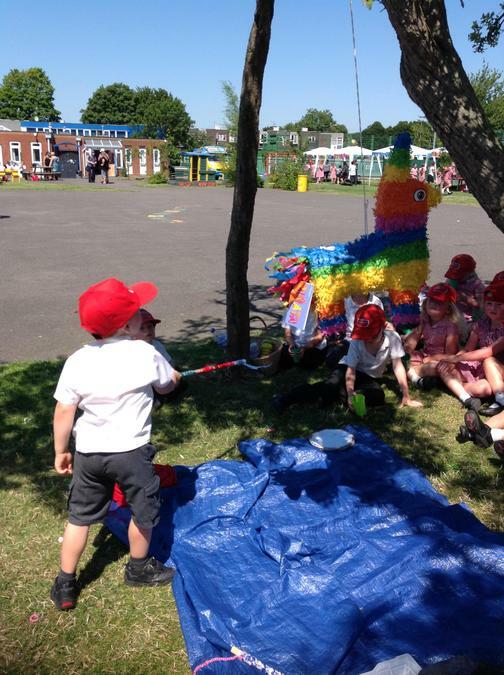 ​This term we are exploring our topic linking the Olympics in Rio and the Country of Brazil through our journey from the Rainforest to the Sea. 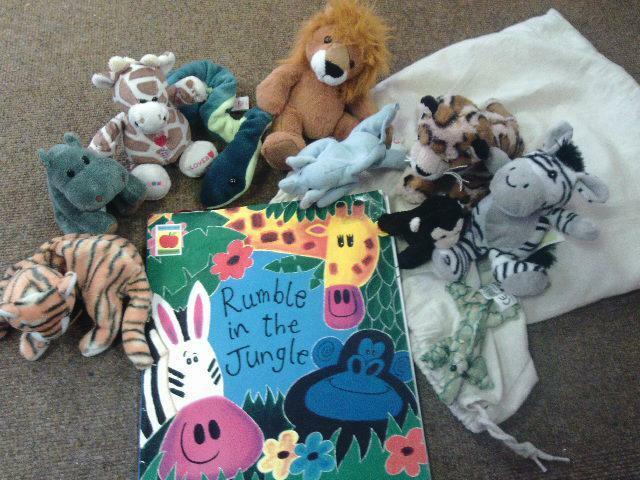 The link for this is through our focussed book 'The Rumble in the Jungle'.The children have started to learn the poems from the book and retell them through actions and words. 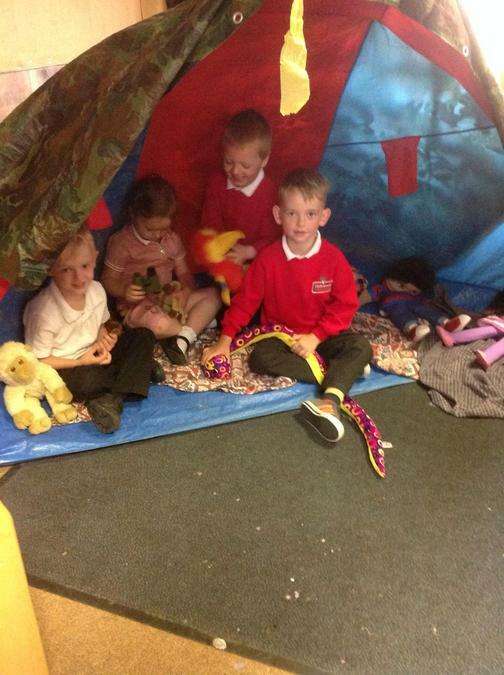 They have also enjoyed the story sack containing all the jungle animals from the poems and rhymes and finding out their names. 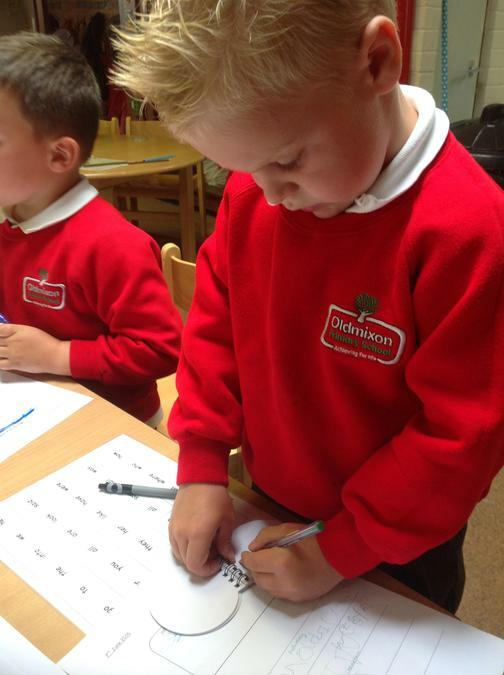 In literacy we have been focussing on careful handwriting; remembering clear finger spaces, using phonics to support spelling of words, appropriate use of capital letters and fullstops, as well as creating a good sentence. 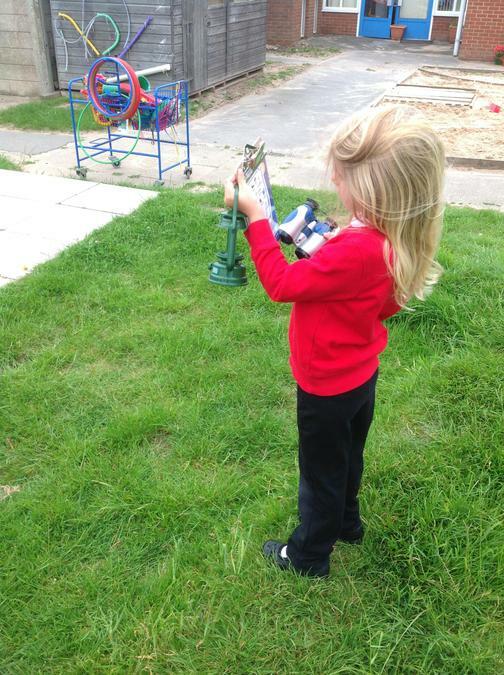 The children have also been practising to write their sight words and notes to their friends, all using their phonic knowledge. 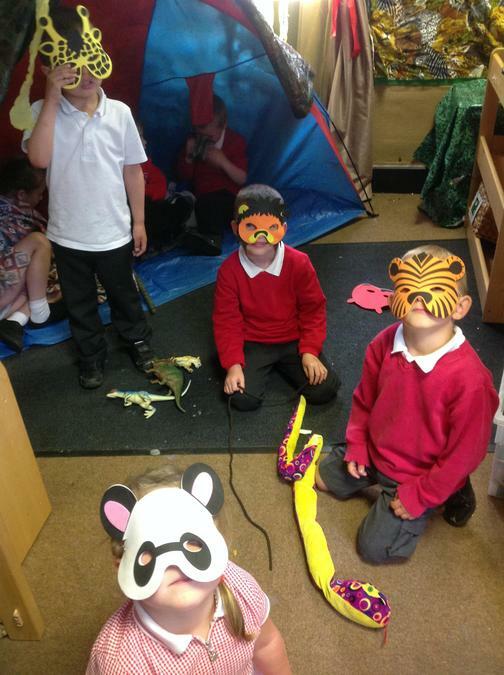 ​The children have started developing the role play area - The Rainforest and animals. 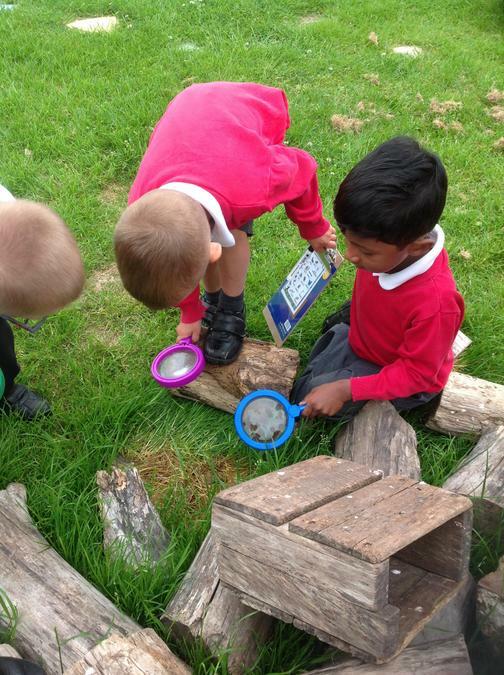 ​Following the children's interests, we have set up an exploration trolley, with magnifying glasses, collecting pots, binoculars and mini beast checklists and clipboards to note what small creatures they can find in the environment around them. 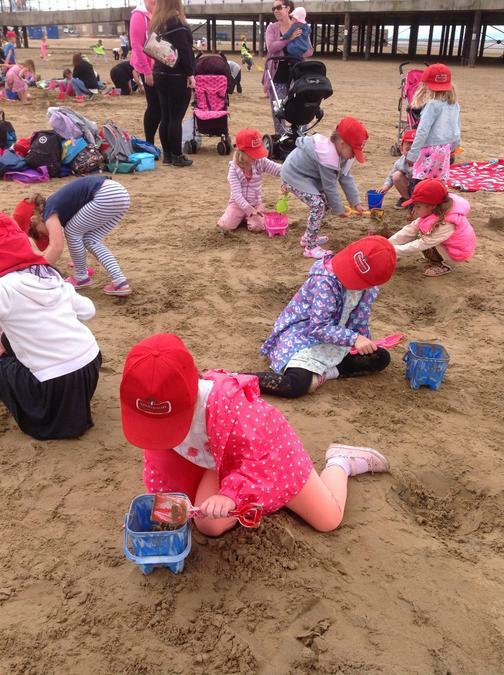 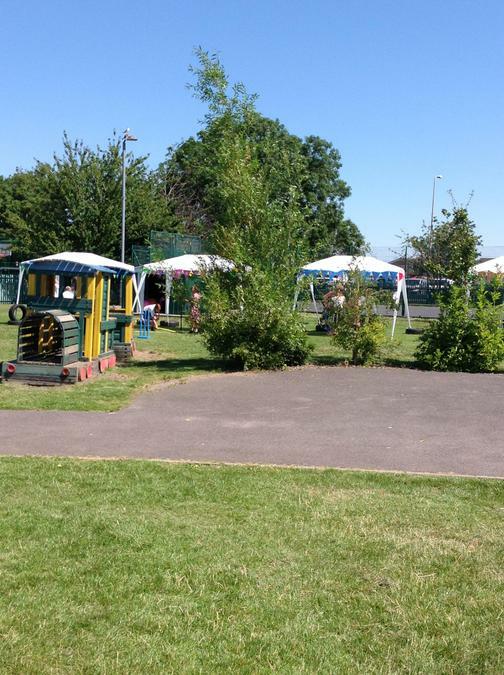 ​We have continued to enjoy the fair weather and our exploration of the children chosen interests, using literacy, mathematical and understanding of the world aspects of learning. 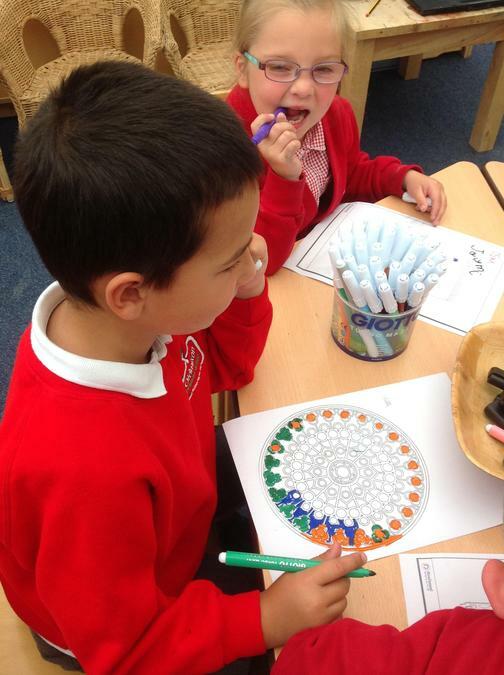 We made some butterfly number bonds and explored painting and printing butterflies using symmetry. 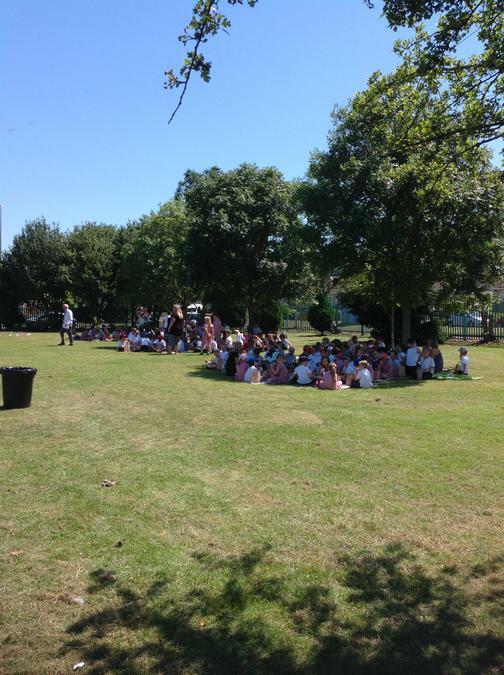 On the Thursday, we took part in a whole school celebration of Ramadan and learning about the Islamic faith. 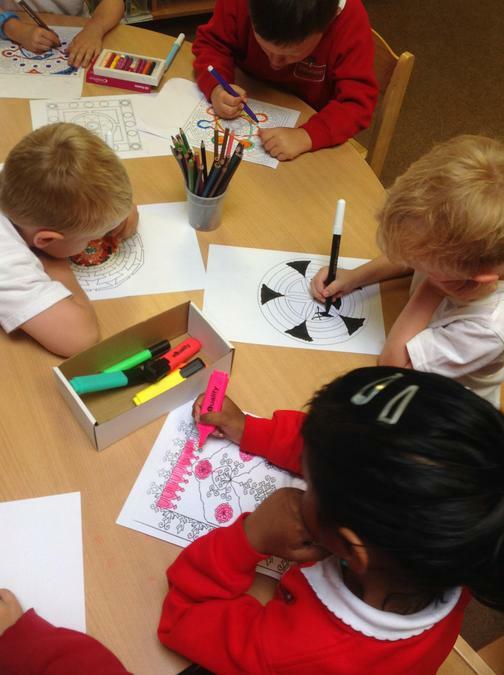 The children learnt about Ramadan, The pilgrimage to Mecca, giving of gifts and the importance of thinking about others and they also coloured in patterns and designs on prayer mats and tasted dates.